Captain Evan Lambert Simmons By; Will Johnson My mother often told me:”Everything was the sea back then.” She meant of course that all our boys and men took to the sea as soon as they had finished the Saba School of Navigation to make a career for themselves. 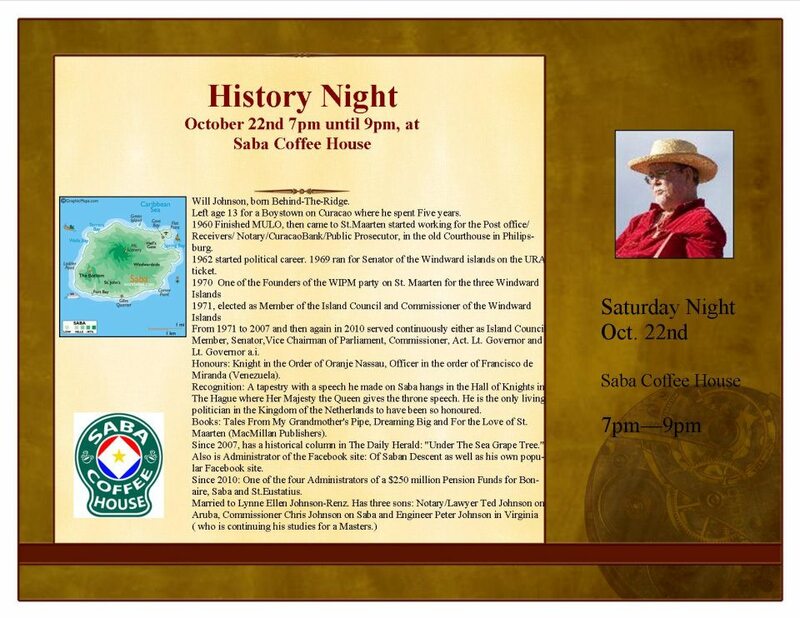 The year 1888 in which Captain Evan Lambert Simmons was born there were 2076 people living on Saba. Nearly all of them had been born on the island. He was one of 62 children born here that year. The difference with him was that unlike most; nearly all the other children born here that year, their parents were both born on Saba, Evan’s mother was born in Philadelphia of St. Barths parents. His father was the well known Island Secretary Engle Heyliger Simmons who was born on Saba on November 9th, 1854 (son of John Michael Dinzey Simmons and Eliza Leverock). His mother Emilie Elizabeth Lambert was born in Philadelphia on November 12th, 1859 (daughter of Frederick Lambert and Susan Lambert). They were married on February 28th, 1881 and they both died in 1920. Emilie died first at the age of 60 on April 15th, 1920 and Engle died on September 15th, 1920. Such is the case often with couples who have been married for a long time. 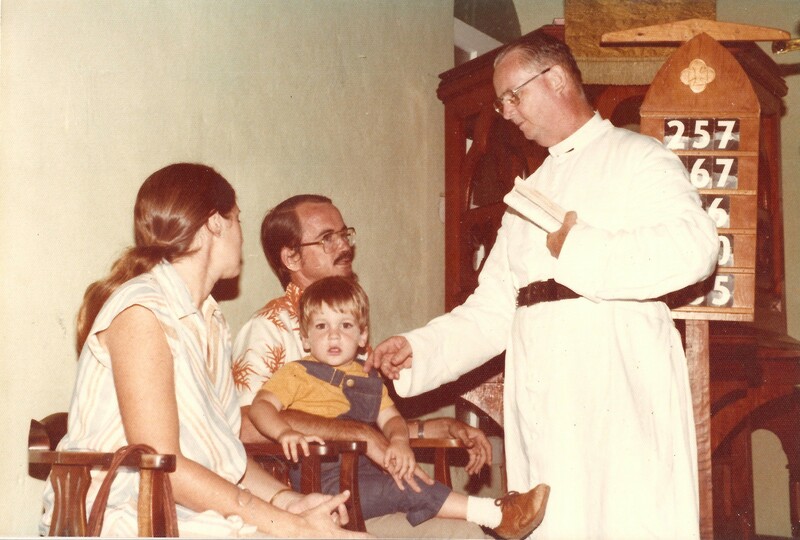 At that time many Saban families had moved to St. Barths then under Swedish rule. There were a number of marriages between Saba and St.Barths people. The same took place on Aruba in later years with many Sabans and people from St. Martin (especially from Simpson bay) marrying, something which had occurred before that time with Barbados where many of the leading families like the Goddard’s, Hart, Bourne, Mayhew, and Hassell families have some Saban ancestors. The home in which Capt. Evan Simmons was born in The Bottom. It was later sold to Mr. Rupert Sorton and still owned by the Sorton family. Emily Lambert born in Philadelphia from St. Barths parents, wife of Island Secretary of Saba Engle Heyliger Simmons and mother of Capt. Evan Lambert Simmons. Evan grew up here on Saba at a time when “the sea was everything” as my mother told me. Many in the Simmons family owned schooners or were captains so that young boys back then took to sea at the age of thirteen already. Evan and his brothers were no exception. He went to the United States for the first time in 1907. The Saba School of Navigation had not yet been officially recognized by the Dutch. However many of the retired captains, for a small monthly fee, were willing to give lessons to the young boys concerning navigation, ports they had been to, horror stories of going around Cape Horn and so on. So that when Evan went to the United States he would have been well prepared for a life at sea. He was born on Tuesday August 28th, 1888. Around 1914 he married Maria Lillian Hill of St. Eustatius. She was born on September 12th, 1883 (her parents were Theodore Heyliger Hill and Robertina Dinzey Horton). 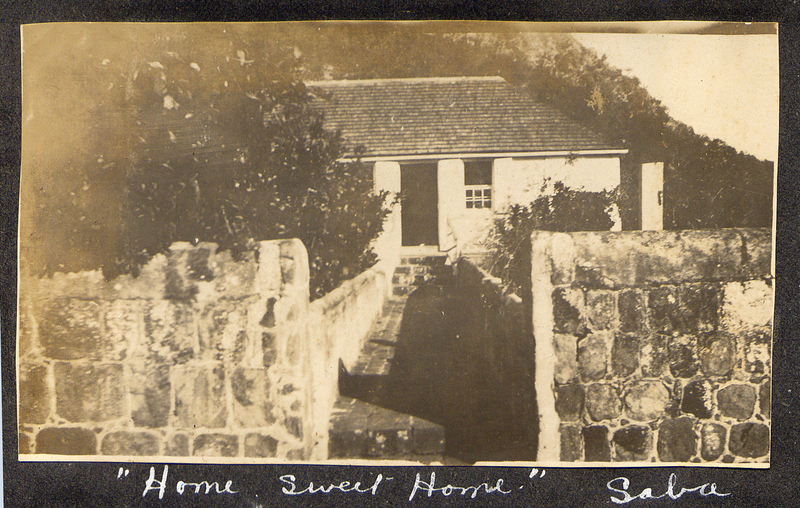 The Hill’s of St. Eustatius and the Horton’s of Saba had several marriages together. On a trip to Statia to visit her parents the couple lost a child not a year old yet, named Ethel who died on May 12th, 1918. The baby is listed as having been born in Brooklyn where the couple then lived. They had three other children: Elaine born 1916, Evan Leslie born 1919 and James born 1920. And so Captain Evan has a number of descendants living in the United States still. On the Amazon website in a comment on my book “Tales from my Grandmother’s Pipe” dated September 12th, 2010 his grandson had the following to say: “ This book has a special meaning for me in that the island of Saba is the birthplace of my Grandfather, Captain Evan L. Simmons, pictured at age 13 on page 72. He was born August 28, 1888 and passed away on January 3oth, 1966. My grandson, his great-great grandson, Evan Simmons the fifth shares the same birthday. I have fond memories of him singing sea shanties to me before falling off to sleep, and his story that I am a descendant of Henry Morgan the pirate. I am fortunate to have his sextant. I will be visiting Saba for the first time next year and this book will provide a wonderful guide for the visit. Evan Simmons.” When his first wife died in 1958, Capt. 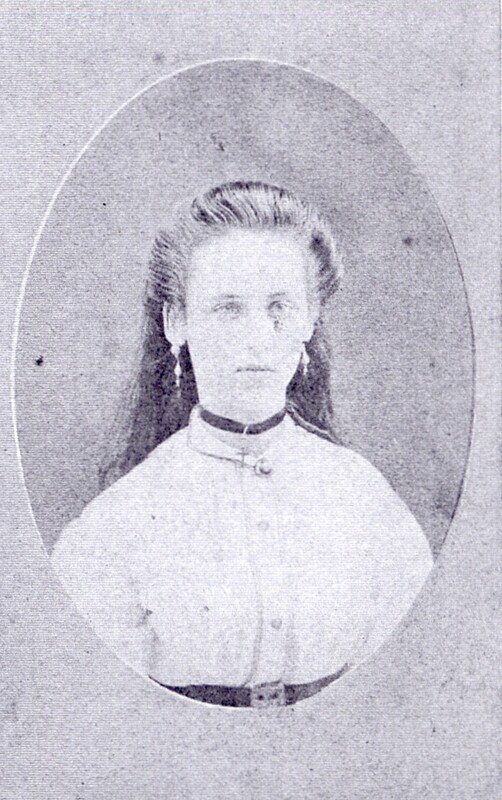 Evan married Olga May Simmons, daughter of Capt. Arthur Wallace Simmons. She was born in 1917 and together they had a daughter Evelyn Marie Simmons born 1959. That lifelong sea breeze had done wonders for the captain as he was seventy one at the time of his last child’s birth. Something similar to my great grandfather Thomas Johnson, who married in his seventies when he was a widower and made four children before he died. That his wife was forty years younger than him would have helped too. As rumor has it my grandmother was ordered on his death bed. Fresh food and regular exercise helped a lot I suppose. 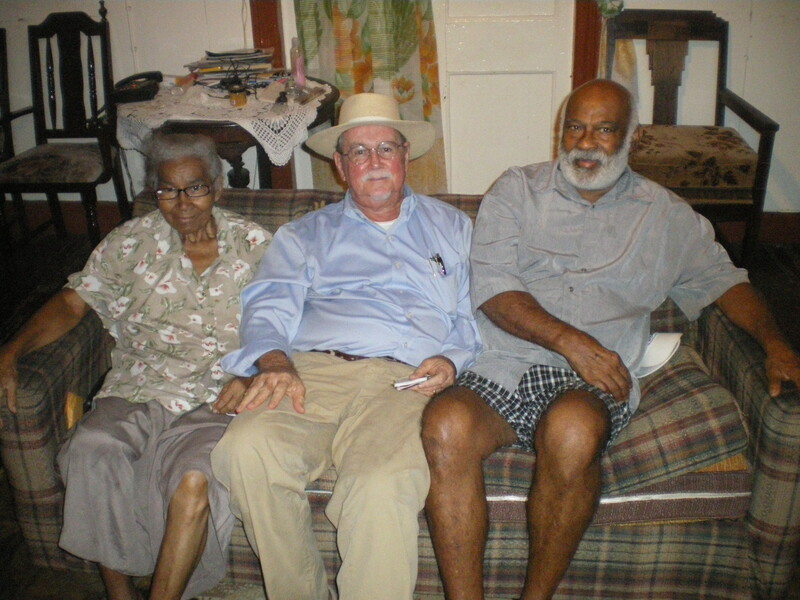 Island Secretary of Saba for more than thirty years Engle Heyliger Simmons and father of Capt. Evan Lambert Simmons. Three brothers, all captains, Evan, Engle and Jim Simmons. Artist Elaine Maria Simmons-Steiner, daughter of Evan Leslie Simmons and granddaughter of Captain Evan Lambert Simmons. She was named after her aunt Elaine. Capt. Evan got his first big commission on the Red D Line in 1919 when he started out being the first officer of the “SS Maracaibo”. On September 20th, 1918 he arrived with his Statia wife Lillian Hill and their daughter Elaine in New York. Their listed address at the time was 811 St. John’s place. Lillian was naturalized by marriage (Evan was already a U.S. citizen) in Southern District Court New York on July 16th, 1912. Captain Evan is listed as 1st Mate on the “SS Maracaibo” on October 28th, 1918. Later on he was Captain of the “SS Lara” and had a long tenure on this ship. He was also captain of the “S.S. Maracaibo”. Mr. David Donker told me that he sailed for awhile with the “Red D Line” on the “SS Carabobo” with Captain Morris. He also sailed with Captain Evan Simmons on the “S.S. Maracaibo”. The ship was caught in a gale in the Gulf Stream off Cape Hatteras. He described it to me as the most terrifying experience in his life. In an article in the New York Times of June 24th mention is made of the wedding of James Lambert Simmons, “son of Capt. Evan Simmons who was a ship captain with the “Grace Line.” In 1936 the “Grace Line” acquired the “Red D Line”. In early 1937 the “Santa Rosa, Santa Paula and Santa Elena” entered the service. Capt. Evan was Master of the “SS Santa Catalina” up until October 15th, 1951. He was Master of the “SS Santa Ana” as of January 15, 1948 and had a long tenure on this ship; He was also captain of the “SS Santa Rosa”. 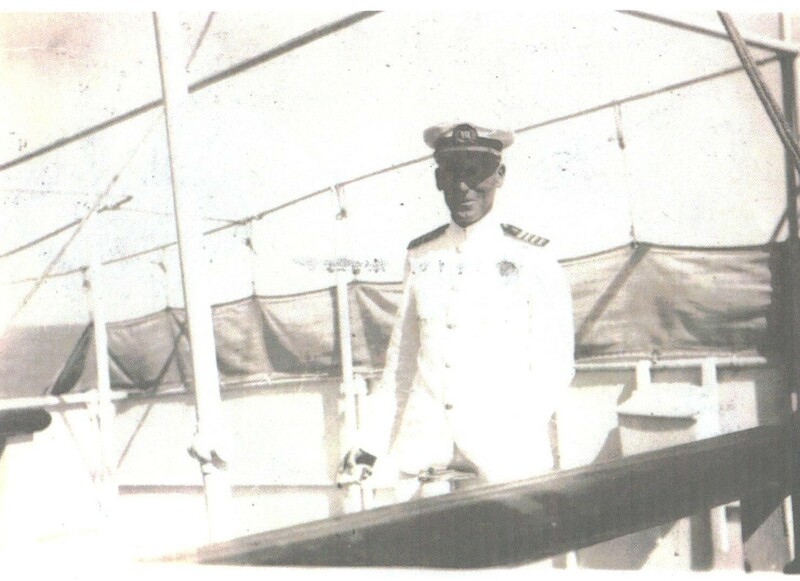 He also served as Master of the” S.S. Chipana” on December 17, 1939. However most of his years at sea he served with the “Red D Line” and continued on with the “Grace Line”. Also serving at the same time with these companies was Capt. James Knight Simmons of Hell’s Gate who was captain of the “S.S. Santa Barbara”, the old “Santa Rosa” and so on. In 1929 there were a large group of Venezuelans working for the SHELL oil refinery on Curacao. Under the leadership of Rafael Simon Urbina and Antonio Machado a large group of Venezuelans took over the refinery on June 8th, 1929. They then attacked the water fort at the entrance to the harbor next to the Governor’s Palace. They then kidnapped Governor L.A. Fruytier and the garrison Commander Boren, after which they commandeered the “S.S. Maracaibo” of the “Red D.Line” which later became the “Grace Line”. I know that Capt. Evan Lambert Simmons was first mate on the “S.S. Maracaibo” in 1918. He also served as Captain of the “S.S. Lara”. Years ago an old man told me that a Saban was captain of the “S.S. Maracaibo” when it was commandeered by the rebels to take the weapons from the fort as well as the Governor. They were hoping to make a coup against the Venezuelan Government. On arrival in Venezuela they let the Governor go but the coup they had planned failed. The Dutch Government fired the Governor even though he had handled as correctly as he could under the circumstances and B.W.T. van Slobbe, a professional military man, was appointed Governor with instructions to fortify Curacao. Commander of the garrison Bommers was imprisoned for one year. I have asked the firm of S.E.L. Maduro and sons Inc., who were the agents for the “Red D.Line” to check their records and see if they can verify for me who was the captain of the “S.S. Maracaibo” when Urbina and his rebels commandeered her to take them to Venezuela.I am fairly certain that it was non other than Capt. Evan Simmons. 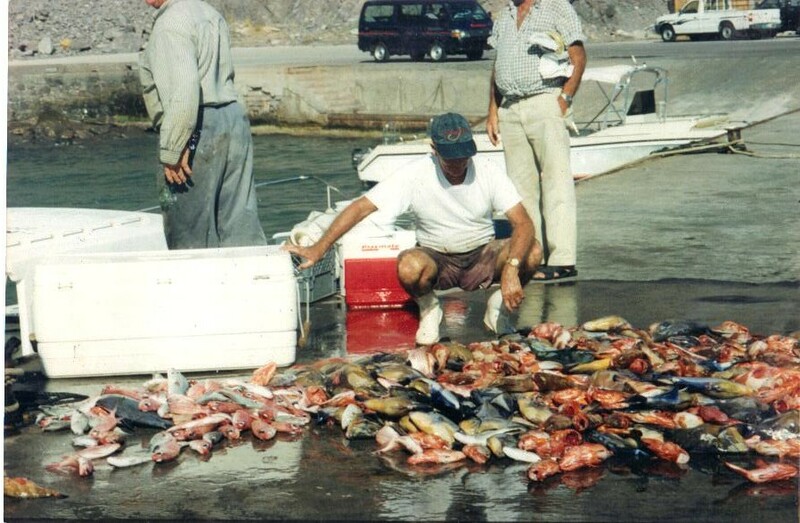 Our Saba captains of former times led interesting lives and as you can read in this article they served all over the world and each and every Saban can be proud of the many notable Captains which the island produced in former times. May his memory live on! 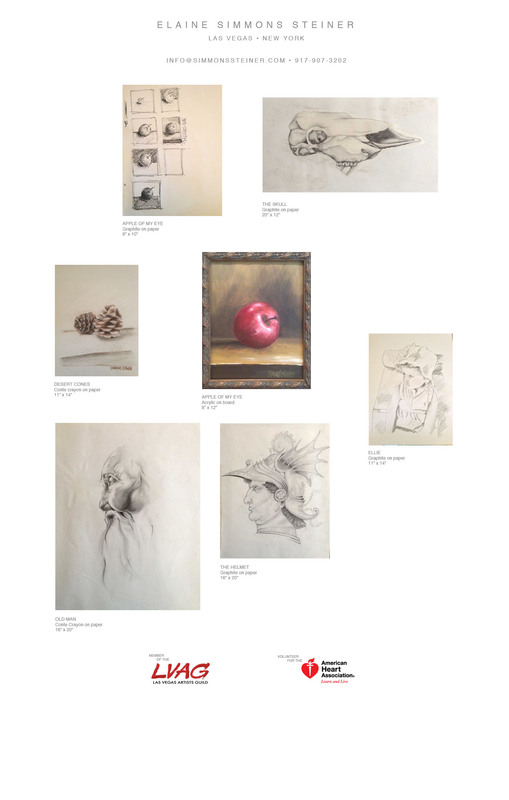 Some of the work of the Artist Elaine Maria Simmons-Steiner, granddaughter of Capt. Evan Lambert Simmons. 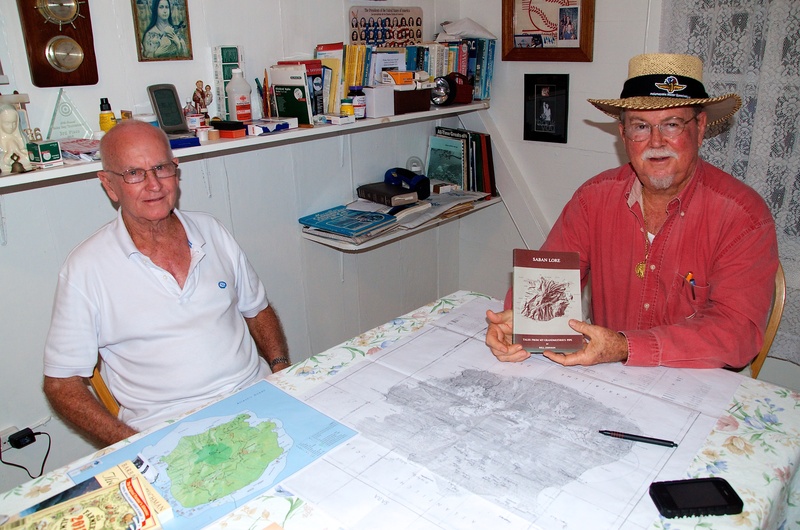 Bernard Johnson and Will Johnson at his home working on the correct names for a new map of Saba. My Cousin Bernard a man for all trades and seasons. James Bernard Johnson was born at Behind-The-Ridge on Saba on November 12th, 1933 and died tragically on September 13th, 2014. His sister Ethel and his brother Elmer passed away years before him. His mother went into a depression when they were small children and his father Peter James raised the two boys while our aunt Sylvie Simmons raised Ethel. I never asked him when and why they left their home at Behind-The- Ridge to live at their grandfather James’ house below the church on Hell’s Gate. As a boy growing up I remember his father living there after Bernard left for Curacao. 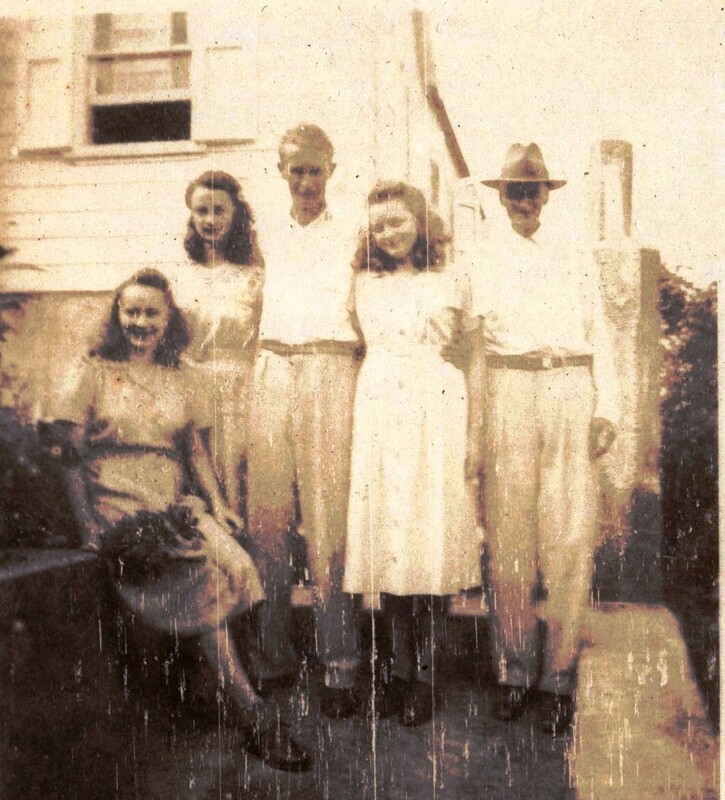 Bernard and his much beloved cousins George Johnson who lives in Florida and his other cousin Estelle Simmons at her home on Hell’s Gate. He will be buried not far from where this photo was taken. Bernard started working here on Saba for himself as a young boy farming and fishing and then decided to follow many cousins and other Sabans to look for work on Curacao. Bernard was a caring person and although he never told me so I am sure that the motivation was also to see his mother who remained on Curacao in the mental institute until her death. Although she had recovered there was no incentive to come back to Saba as her husband had in the meantime passed away. He never thought of leaving Curacao until his mother passed away in the nineteen seventies. Many times he told me about going to Curacao and leaving his old father behind. It was a hard decision for him and he never saw his father again. He went down on the monthly steamer the “Kralendijk” and I remember him telling me that they had to spend an extra day at St. Eustatius to load yams and sweet potatoes which back then were shipped to Curacao for sale there. Bernard was only seventeen when he left so that would have been in the year 1950. 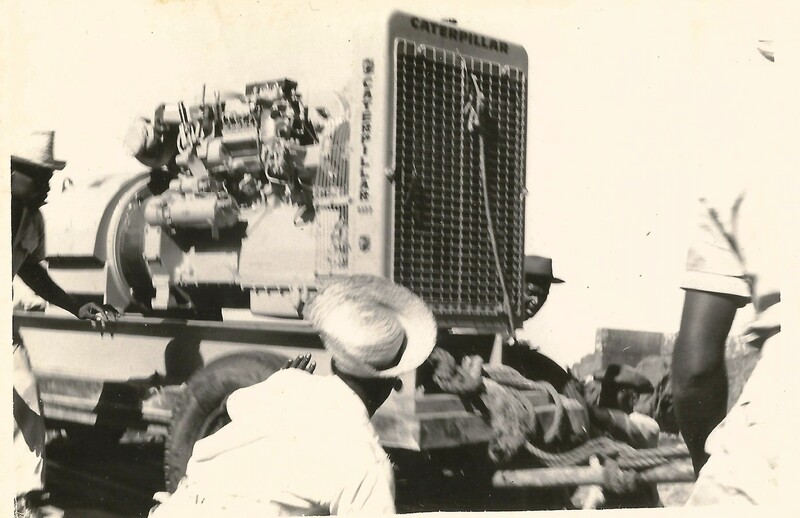 On Curacao the men from Saba were known as Navigators and so he found work on an oil tanker which belonged to the fleet of the SHELL Company transporting crude oil from Lake Maracaibo to the large oil refinery on Curacao. They also carried refined products to countries like Panama, Colombia and so on. He did this for a couple of years and then started to work as a bartender. When I went to Curacao in 1955 he was working at the Hato airport in the restaurant. He later worked in a nightclub named Bahia on the waterfront in Willemstad where from behind the bar he could see the ships coming and going into that lovely harbour. Later on and for many years he worked for the Chinese owned restaurant the “Lido” on the later named Dr. Gomez square not far from where he used to work in the nightclub. It was at the “Lido” where he used to make quite some money for those days. His salary was thirty guilders per week, but he had a deal with the owner of the restaurant that he would get ten per cent of sales which he made as an incentive for him to work as hard as he could. Also he was allowed to keep all the personal tips he received. Lido was one of the few strategically located Chinese restaurants and in those days the Grace Line cruise ships brought in a number of tourists. There were also many tourists from Venezuela and Colombia who came to Curacao to shop. Bernard quickly learned enough Spanish, Dutch and Papiamento to be able to communicate with his customers besides his native English. And so for those days his income was a lot more than the other cousins and acquaintances from Saba were used to. When the workers revolt took place in 1969 he suddenly received a minimum wage of one hundred and fifty guilders a week, five times that which the restaurant owner had volunteered to pay him in the past. Bernard had a good personality and became close friends with the other waiters and bartenders with whom he worked for many years. People like “Kiki” from Bonaire, and Joseph “Josie” Woods from Saba and many others were close friends and lived with him like family. They lived at several locations in Willemstad. 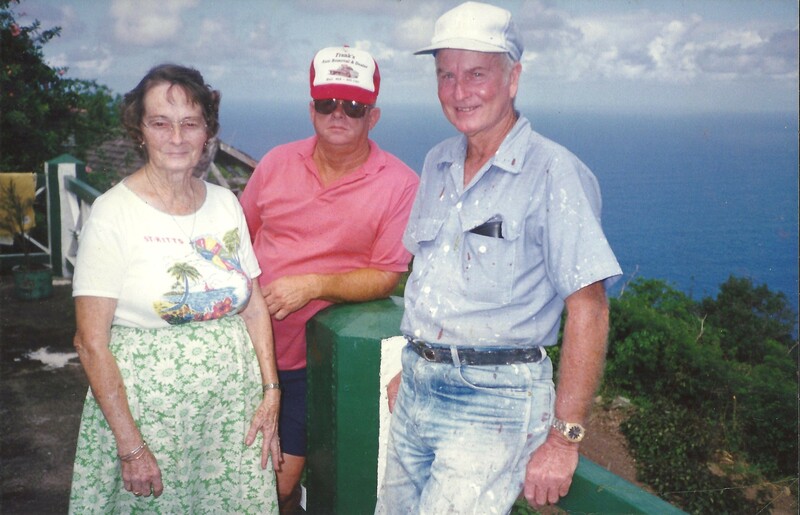 When our cousin Hortencia “Tencie” went to Curacao she was later joined by Bernard’s sister Ethel and his brother Elmer. I used to visit them from time to time but not often as in the Boys Town where I lodged we were under restrictions. Study and discipline came first and family visits were only for those Curacao boys who lived at the far end of Curacao “Banda Bou” and whose parents lived there. 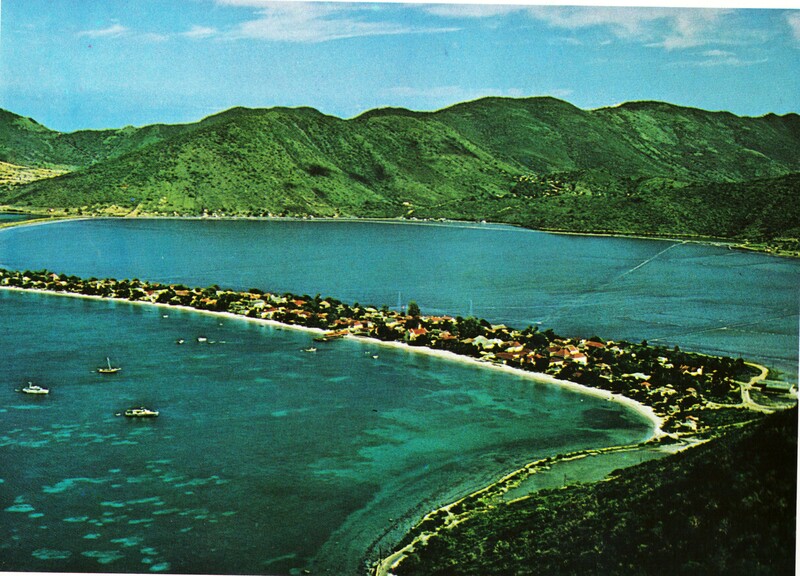 We became closer when in October 1962 I was sent from St. Maarten to Curacao to take a course in taxes. I lived at the Washington Hotel and it was run by Irma Hassell of Saba. I worked in the customs building on the corner of the floating market and the entrance to the harbour. From Hotel Washington it was but a stone’s throw from where Bernard and his family lived. His sister Ethel was married in the meantime to Otto Hassell and started her own family. Bernard stayed with her and a number of other Saba people boarded there in order to help with the monthly rent which at that location was quite high for those days. Bernard surveying some of the fish which he and others had caught after a few hours of hand line dishing on the “Saba Bank”. 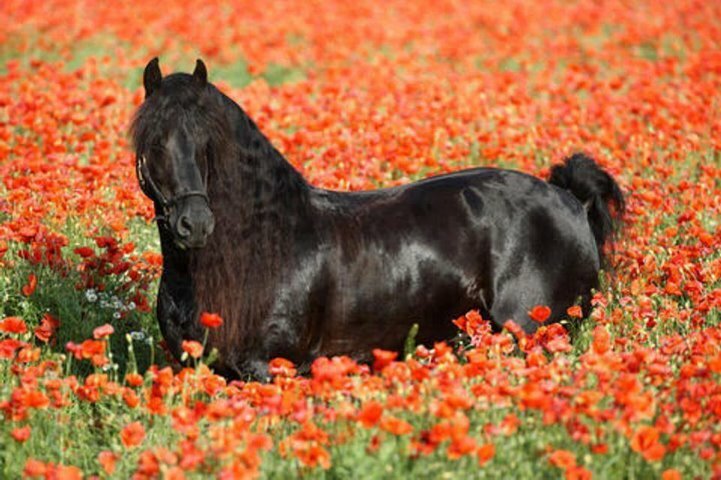 Bernard loved to play the horses and buy numbers and lottery tickets. His number never came in and he was happy for me when mine did. On Curacao I was quite often broke and Bernard would finance me and several times that I owed him more than I could ever repay him I would buy a number and to his and my surprise would win enough money to pay him back. Even the day before I left and after having made arrangements to send him the money I owed him from St. Maarten at the last minute I bought a number which he thought would not play as it had played just a week before, but it won and I was able to not only pay him back but carry the surplus with me to St. Maarten. Up until he died he took care of my lottery tickets and the last conversation we had the night before was about the tickets which had played the day before. He was not an envious person and was a caring person for others. Perhaps because of the tragedy with his mother knowing that she was alive but at the same time he could not see her or feel a mothers touch this gave him an extra incentive to help others. His nieces and nephews were his only children and especially when his brother and sister passed away at relatively young ages his role as a father figure expanded and remained constant until his tragic death on September 13th last. After the Lido restaurant closed down he went to work for a Chinese restaurant in Salina named Lam Jung, where he worked with old friends. Bernard in politics. In the election for Senator in 1969 he ran with me as a candidate on the URA list. 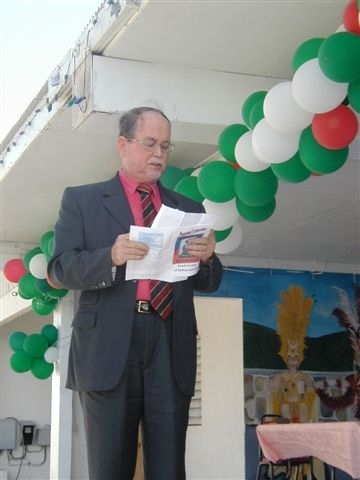 Vincent Lopes of Statia used to refer to the party as the “United Russian Alliance”. 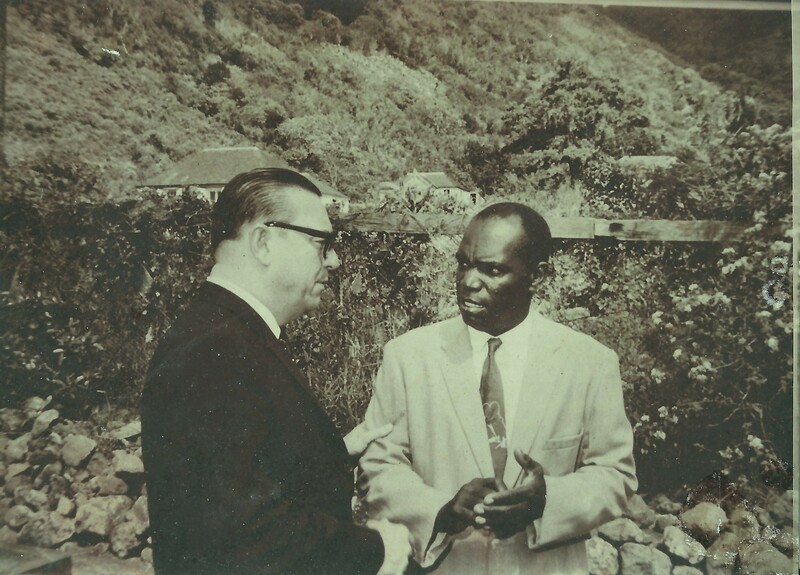 In 1969 I encouraged him to go on the list of candidates of the URA party. He was still living on Curacao then and our list of candidates was for the elections of a Senator for the Windward Islands. An election which I had absolutely no chance of winning but it was a good opportunity of introducing me as a candidate for the first time even though I had been politically active since my school days. Saba started calling to him in the nineteen seventies. He brought his nephew Raymond first and I obliged him to give his nephew work with the Public Works department. He said he could not go back to Curacao in peace before that happened and so already he was fast becoming the father figure which his nephews and nieces needed. Accustomed as he was to work for Chinese employers, when he came back to Saba he started working as bartender and waiter for Choi’s Chinese restaurant here. When Her Majesty Queen Beatrix, visited here as Queen for the first time in 1980, he was one of the waiters at the Captains Quarters Hotel. Bernard used to love to fish on the rocks. Here he is throwing out a line on the high cliff close to Cove Bay. 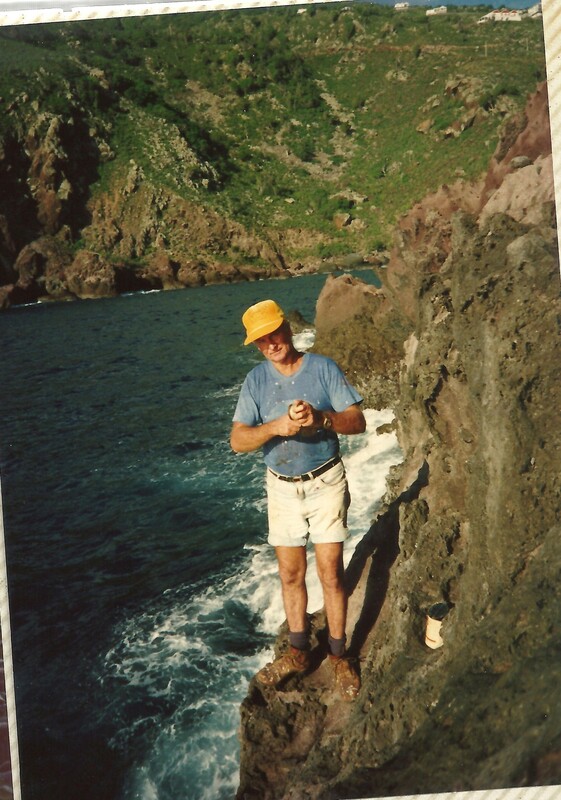 Here on Saba he went back to fishing and was always known as a good fisherman. He also loved to farm and to keep cattle. For some years he worked here in The Level and planted Irish potatoes and kept some large bulls. He always over estimated the weight of his bulls and would show boyish disappointment when they were below the expectations of other people. After he retired from Chinese employ he started out as a house painter and he seemed to love it. When his brother Elmer passed away suddenly he asked me if he could stay in the house of my deceased parents. It was empty at the time. Without asking my brothers I told him to go ahead and live there. Up until his death thirty years later he lived in the house and took care of it as if he owned it. He was a great help to my Brother Eric’s family while he lived there and also our many other cousins here like Estelle Simmons and our Uncle Leonard’s children in the United States. 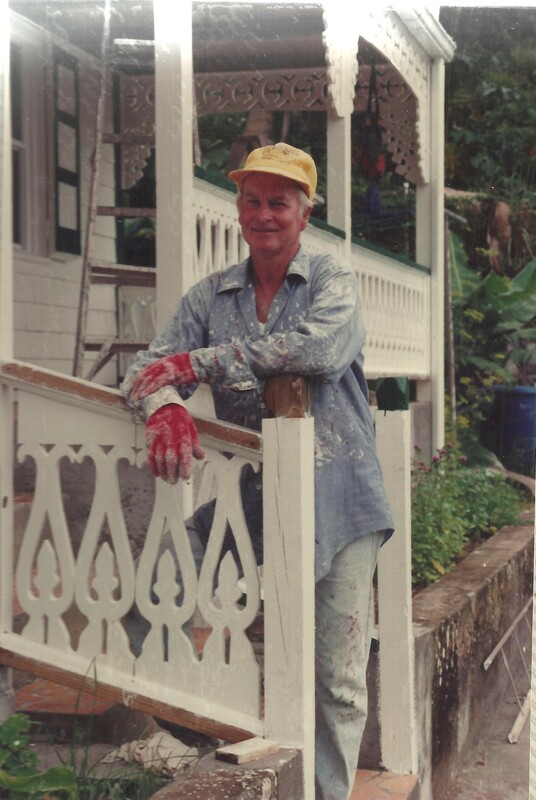 He would go on vacation to New York and other places where our cousins lived and would help to paint their homes while he was on what he called a vacation. After some time he got fed up with the restaurant business and started out as a house painter. He was never out of work. You had to line up to get him to come and work for you. And he continued painting until he started having heart problems and had to go to Colombia for bypass surgery some year’s ago. I would call him or his nephew Raymond nearly on a daily basis to find out how he was coming along. He recovered quite well from that but he was getting close to eighty and finally started to take it easy though he was always on the road being helpful to others. 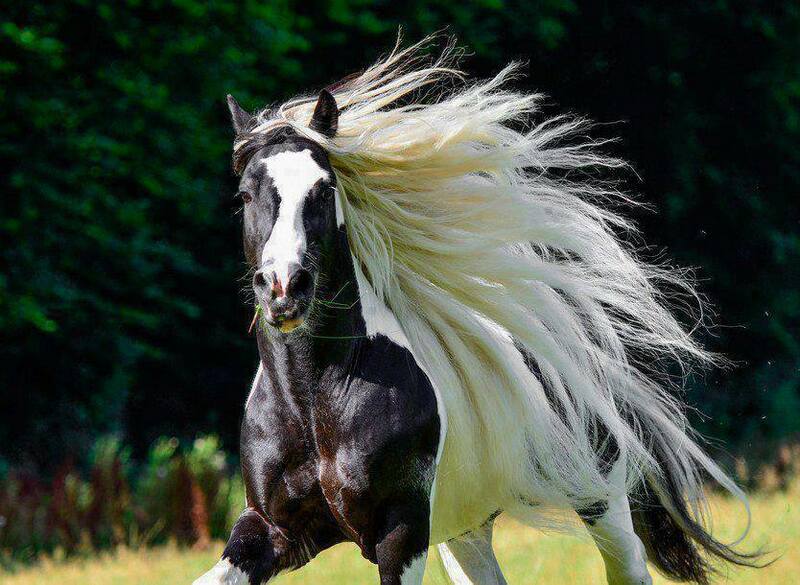 He loved the horse races so I am posting this lovely horse to remember the many horses he used to bet on. 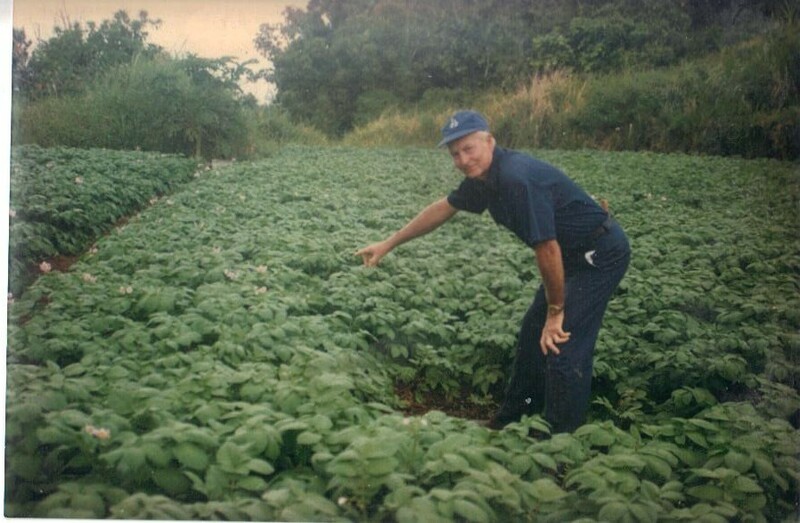 Bernard her showing one of his potato crops at The Level Saba. He loved to watch the boxing matches and horse races and considered himself an expert on the various horses running. Wherever I was he was call me to remind me that the Kentucky Derby was coming up and we would discuss the horses with the best chance of winning. He was usually right of course. And even if he was not right he was so stubborn in his opinions that he became known for that. So to maintain the brotherly relationship we had always enjoyed I never argued with him. After he acquired his satellite dish the Chinese television news guided his opinion of world affairs. I guess having worked for Chinese employers most of his life he became prejudiced in their favour. He also liked the Russian television, so much so that when I was in St. Petersburg I brought back two small stones for him from that lovely city on the Baltic and declared him the Russian ambassador. When I saw something of interest on another channel I would give him a call and tell him about it as he also loved nature shows. Even last night I saw a woman being interviewed in the Crimea who said that in 1991 there had already been a referendum and that overwhelmingly the people had voted to go back with Russia. However she said that Yeltsin had been drunk for ten years and had let Russia go down the drain so nothing came of the referendum. Without realizing I said to myself: “I have to tell Bernard about that one.” But then I realized that there would be no more almost daily calls to Bernard and it dawned on me that he was gone. At Saba’s Treasure right to left Bernard, Will, Eric and now Island Governor Jonathan Johnson, all cousins. On the right, Bernard’s father Peter James Johnson, with his daughter Ethel (Bernard’s loving sister) and Bernard’s cousins Leslie Johnson, Gladys Johnson and seated Estelle Simmons. As sad as it is that he went in an accident, it was classic Bernard that he was doing a job and died on the job. I never thought of Bernard dying in a hospital bed or in his chair watching the Chinese news channel. He was a good driver and very proud of his driving skills and perhaps fate meant for it to be that he would meet his end behind the wheel and on the job. 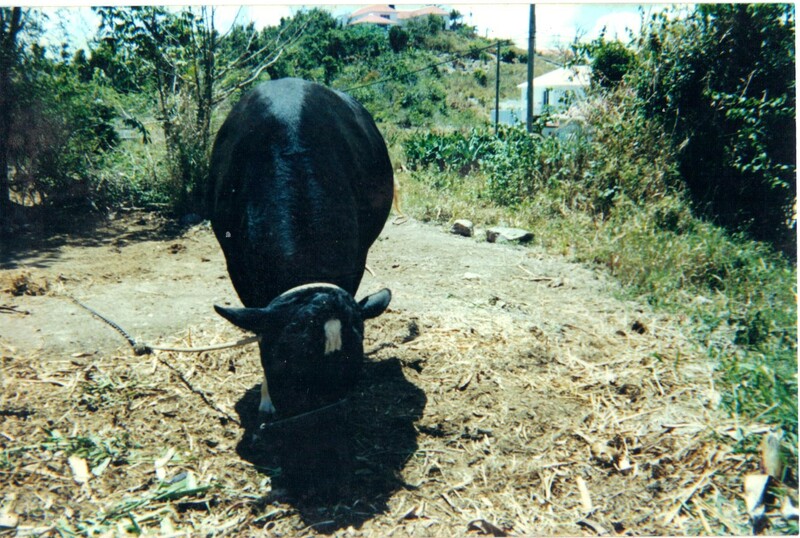 One of Bernard’s bulls which were raised not only for their meat but also for manure for his Irish potato crops. He will be sorely missed not only by his family but by his many personal friends like Franklin Every, Alfredo Hassell, Jeremy from Haiti and so many others in the community at large. One of his hobbies was also carrying people around the island on its various trails. He knew them like no other and had wandered them since he was a boy. We had been born on the cliff just above the sulphur mine and he also loved to carry people there as well. The last project we were working on was to identify all the various names around the island and all the fishing rocks by name around the coast. He also kept the records of rainfall on Saba going all the way back to the nineteen eighties and was often consulted on weather events such as hurricanes long before we had all these weather channels we now have. In the last two years he spent quite a lot of money fixing up his family cemetery where his father is buried and he will be laid to rest next to his cousin Howard Johnson where hopefully they can continue their conversations on farming and fishing and life on Saba as they knew it and loved it. Bernard my cousin, my brother rest softly. You deserve the rest. And to his family and friends rest assured that Bernard has left behind a legacy of helpfulness to not only his family but to all of those who came into contact with him over the years. RIP. James Bernard Johnson in a photo taken by cousin Carmen Johnson not so long ago. The painting of Saba behind him is one which was done by Eric Milton Johnson son of Harry L. Johnson. Jacob Frederick born December 25th, 1955 visiting me at my home September 7th, 2014. His brothers Masclem Frederick and Fautulus Frederick were the elected chiefs of the Carib reserve on Dominica, and now his cousin Charles Williams is the Chief. His daughter Liana is married to my cousin Travis Johnson. Often when working in my yard I have found “thunder stones.” I have quite a collection of them. We used to call them “thunder-stones” when I was a boy. The popular opinion then was that white stones fell from the skies when there was a lightning storm. 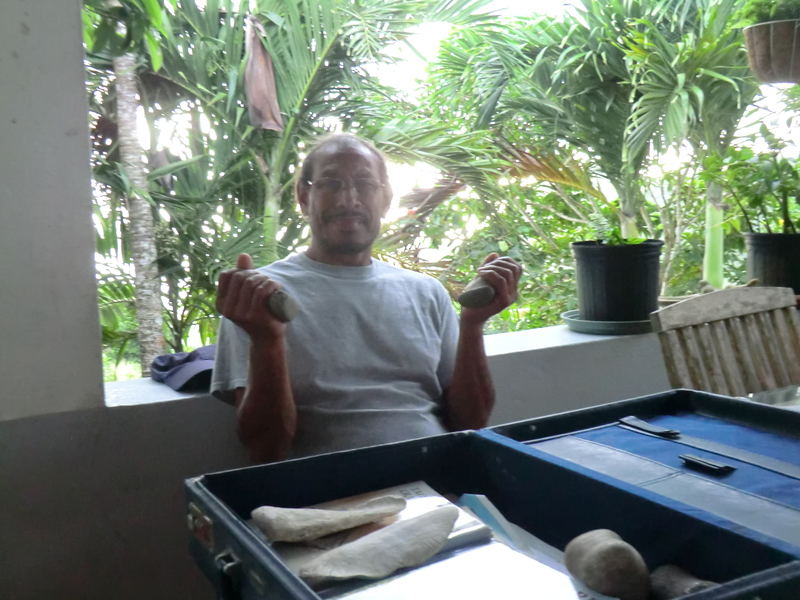 What we called “thunder-stones” were actually tools made by the Amerindians from the shells of the conch. In observing these stones and other Amerindian artefacts I have found here in my yard I am reminded of the sad lot of those who first inhabited these islands. The memory of the Kalinago (Caribs) and the Arawaks has long faded. Here on Saba oral history has been passed down to us in the legend of “Johnny Frau and the Great Injun”, the last Cacique on Saba. I have a coral amulet in which a hole was drilled by some Amerindian long long ago. I wear it on a chain around my neck and when people ask I tell them that it belonged to the last Cacique on Saba. How I wish that it was so. Jacob Frederick an artist and one of the Carib elite of Dominica here on my veranda holding some of the tools of his ancestors which were found on the island and around my home here on the hill in The Level. Few on Saba remember or know of the legend of the Great Injun which people in the village of Hell’s Gate used to pass on to their children. Where I live at about two thousand feet above sea-level there is a good view of all the neighbouring islands, as far away as Montserrat. On an exceptionally clear day years ago we even saw for a few hours the hills close to English Harbour on Antigua. From this spot any enemy canoe could be spotted long before they made landfall. The original inhabitants would have had enough time to either hide, or to make preparations to do battle if the canoe had people coming to our island with bad intentions. At times I fancy that I hear footsteps in the rustle of the leaves. The spirits of those old warriors of yesteryear are still scanning the far horizon looking and waiting to see if there are any canoes with warriors on their way. Once when I was off-island a visiting Simmons aunt of mine was offered my house. When I came back I learned that she had moved out after the first night. She said she could not sleep as she was hearing people talking all night under the trees in my back yard. I reassured her that it was only the spirits of the Indians whom I had made contact with in the ghost world and who guarded my house. I had not informed them that I would be off-island. Well that reassured her all right. On his second voyage in 1493 the fleet of Columbus passed close to Saba. The fleet consisted of 17 vessels and 1500 men. The next landfall after passing Saba was the Salt River on St.Croix. It was there that the native Kalinago took the first recorded stand against the European invader. The ones who observed that fleet from where I now live must have been truly amazed. It would be quite a sight even today. Imagine for people who had never seen a sailing craft before to suddenly see seventeen of these sailing craft passing close to Saba heading West. Some of the Amerindians to have settled on Saba were the Ciboney whose economy depended on marine resources and on foods gathered and hunted from the land. Evidence of these “Archaic” or pre-ceramic people is strongest in islands such as Antigua, Trinidad and Martinique. Our European ancestors used to tell us that on Booby Hill “The Ferrises Cave” and above Palmetto Point (Mary’s Point) there lived a small sized Indian people with beards who lived in caves. On the island of Flores in Indonesia there has been much commotion in recent years about a new branch of mankind, now extinct, found there. The “Ferrises” which we were told about seemed remarkably similar to the extinct small race of people on Flores. The Arawaks were highly skilled navigators, mariners, and pottery makers. These early Caribbean people introduced agriculture into the islands, mainly in the form of Cassava – their staple crop. From 150 AD and over the next 1200 years they engaged in trading and exchange with other groups in other islands and up and down the Antillean chain, bringing subtle changes to the population structure and its culture. A final migration from South America brought the Kalinago (called Caribs by the Europeans) into the region around 1450 AD – less than fifty years before the Europeans were to set foot in the Caribbean. The pre-existing Amerindians were overrun by the Kalinago (although much of their culture, language and skills were absorbed and endured in a modified form). More warlike than their predecessors – or perhaps simply more threatened – the Kalinago vigorously defended their new homeland against any attempt at foreign occupation. The report of Coppier and the story of “Johnny Frau and the Great Injun”, led the University of Leiden, starting in the nineteen seventies, to do research on Saba. This was also done as a follow-up to research done on Saba by Dr. Josselin de Jongh in 1919. The Europeans changed the face of the Caribbean so much so that if the original inhabitants returned today they would only recognize parts of Dominica. Among the plants we take for granted today, these are some of the plants introduced into the Caribbean. Sugarcane from India and the Malay peninsula. Also brought in were bamboo, breadfruit, casurinas, coconut palms, citrus, mangoes, tamarind, banana, bougainvillea, hibiscus, oleander, poinsettia, thunburgia, and even Guinea grass. Research by the University of Leiden, aided by unmentioned locals, have located the old Indian village at Spring Bay. Excavations at Calabash Ridge have indicated that the Kalinago or Igneri were probably still living here when the first European settlers came to the island. This lends even more credence to the by the tale of “Johnny Frau and the Great Injun”. Very little is known about their language. Columbus claimed that the language spoken by the Kalinago sounded like Italian. Historians claimed that the women spoke a different language to that of the men. The Kalinago of course captured Arawak women who continued to use their native language among themselves. After the coming of the Spaniards and other Europeans, the native Amerindians lost ground so rapidly that philologists can find only passing similarities between the language of yesterday and today. An interesting case in point is Aruba. It is one of the few Caribbean islands whose present inhabitants show strong traces of Amerindian blood. 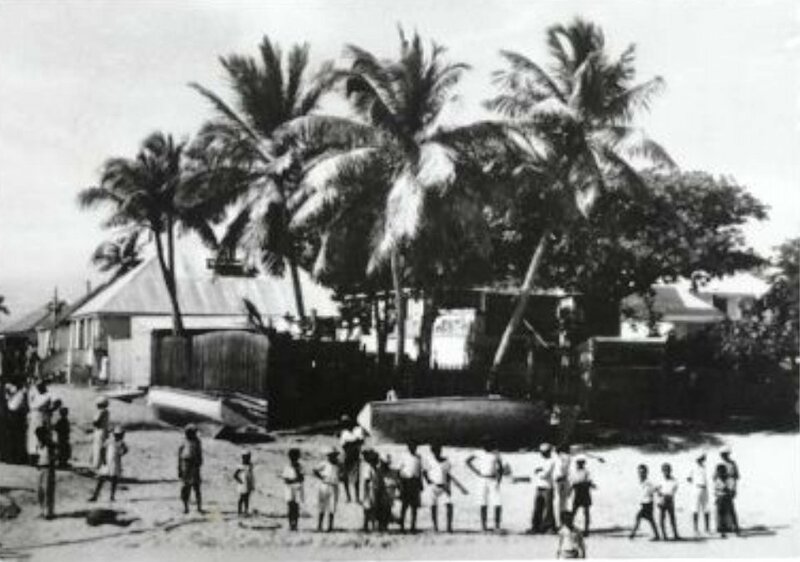 Until the end of the eighteenth century the inhabitants of Aruba spoke their own patois which was partly rooted in the traditional tongue of the Amerindians who were the sole inhabitants long after European colonization began. The 19th century explorer A.L.Penart gives a few examples of the old Amerindian Aruban language which became extinct as recently as the beginning of the nineteenth century. in the year 1882 Penart talked with some natives “far advanced in years” who, though they could remember several expressions their fathers and grandfathers used, were no longer able to converse in the language of their ancestors. Other researchers leave us with some of the words used by the Kalinago which sounded to Columbus like Italian. Of course hurricanes and hammock are some other words of Amerindian origin. On Saba we call the avocado a “Sabocau” the same as in Trinidad where there were also Igneri living. We also know the name of a Kalinago Indian Princess who was in the service of the Governor of Antigua. Her name was Zulmeira. “Vidie pahidie, maranako tubara tehira deburro hadara karara.” These were probably good West Indian cusswords directed at Madame Squaw as to how to get that so and so bone out of the chiefs throat. I want to conclude this article with the story of Johnny Frau and the Great Injun as recorded by the late Richard Austin Johnson who grew up on Hell’s Gate hearing this story from his ancestors. “The early settlers on Saba, in their search for fresh water, discovered a spring on a rocky beach on the East end of the island. Because of this spring the bay became known as Spring Bay. In order to have drinking water, the settlers would have to bring it on their heads in wooden tubs and kegs, uphill to their village, located about two miles away and fourteen hundred feet above the sea level. Near the Spring there also lived Carib Indians in makeshift huts and caves. The white settlers often had to go without water, because of fear of these fierce Indians, especially one, known as the Great Injun because of his huge size. One of the settlers named Johnny Frau, decided that they had taken enough from this Indian, and also being a giant in size, he went alone, carrying his water keg, in order to entice the Indian to fight with him. Sure enough the Indian saw him coming down the hill, and thinking this was a fine chance to kill the white man, he hid himself on a ridge which later became known as Fair Play Ridge, and attacked Johnny Frau with a club. A fearful struggle ensued. They fought and battered each other until eventually they reached the sea at Spring Bay. Entering the sea they continued fighting until overcome with exhaustion and loss of blood, both of them drowned. The body of the Great Injun was never found, but Johnny Frau’s body was cast up into a pond near the airport, and this spot is known as Johnny Frau’s Pond to this day. For many years afterward the superstitious settlers at Hell’s Gate declared that on the night of the anniversary of the discovery of his body, a tiny blue light could be seen moving along the sea edge near the pond. This, they explained was the ghost of Johnny Frau, still searching for the Great Injun. 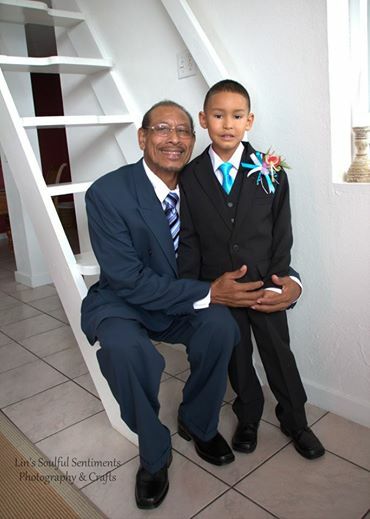 Jacob Frederick with his grandson Trevon Johnson, a future leader of the proud Carib nation? Some years ago some local fishermen were scared out of their wits when they were fishing along the rocks at night and they saw a light passing along the cliffs. They were convinced it was a UFO until I told them the story of Johnny Frau and the Great Injun. The Great Injun or the last Cacique would be proud to see that once again there are some Kalinago people, living ,working and producing offspring on Amonhana the Kalinago name for Saba. 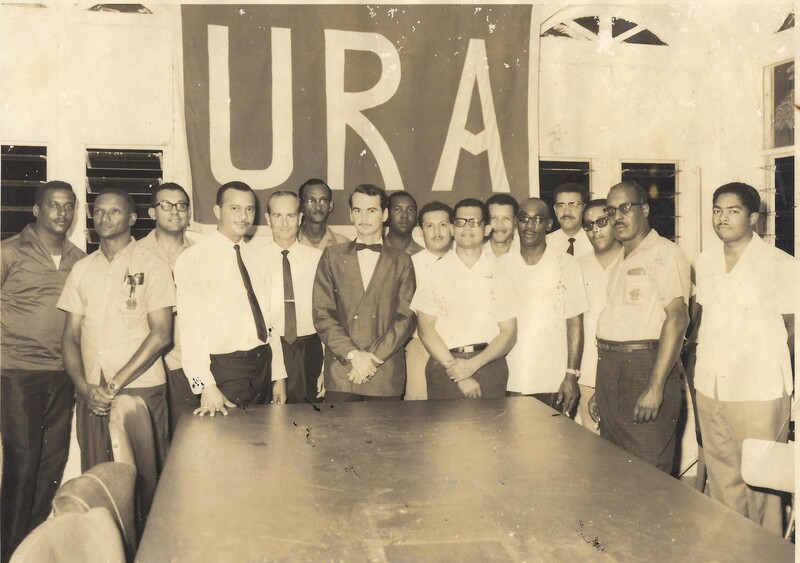 But like Cuba and Aruba, Saba is also said to be of Arawak origin meaning “The Rock.” When I was in government I had a flexible policy toward the Kalinago people and told my colleagues in Government to remember that these were the original people of these islands and they should be made to feel welcome as this was once THEIR home. Commissioner/Island Council member Will Johnson in a speech to the Island Council of Saba. I leave like I came. The poet Robert Frost wrote: “ I shall be telling this with a sigh. Two roads diverged in a wood, and I…. When I got involved in politics in l962 it was with a view to improve living standards on Saba. This should not be confused with the quality of life. Despite the poverty and lack of modern facilities, the quality of life was far better when I was a boy growing up on Saba than it is today. Back then one day flowed into the next. There were no artificial noises to disturb your peace of mind. The rustling of the leaves in the wind and the crowing of the rooster to announce the dawn of each new day, were the only real noises which you could hear. Representing Saba in the First Chamber of the Dutch Parliament in The Hague. Human noises were those of the farmers shouting across the ravines to their family or friends ploughing away in the rough soil. They were attempting by the sweat of their brows to keep their families alive. We owned the land and the land sustained and strengthened the men and women it produced. They sailed away to foreign lands and distinguished themselves in many fields. 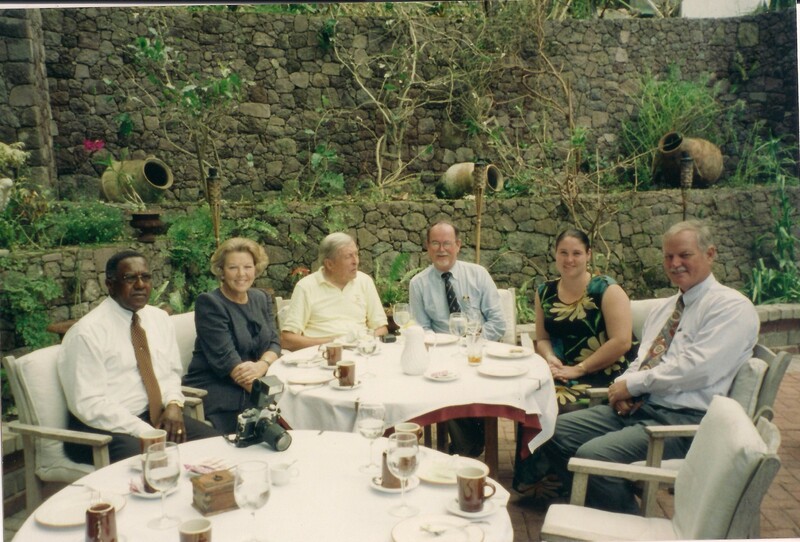 Having breakfast with Her Majesty Queen Beatrix and her husband Prince Claus along with members of the Island/Executive Council, Lisa Hassell, Rolando Wilson and Senator Ray Hassell. I grew up poor on this island and I have enjoyed a rich life. I have dined with Queens and Presidents and lived the humble life with the people of my youth and their offspring. In all the years in politics I have maintained a strong support among the people and thanks to them and my perseverance and with Gods help I have come this far. Photo taken by Editor Roger Snow of The Daily Herald while doing an interview. I have set many records in Windward Islands and Saban politics. I worked hard for the opportunity to serve the people and they rewarded me with many victories. I never lost an election while I was sitting in the Commissioners chair and directing my party. When I did lose it was from within the party and with me on the council unable to influence and direct my party to victory. I started out in active politics at the age of 20. 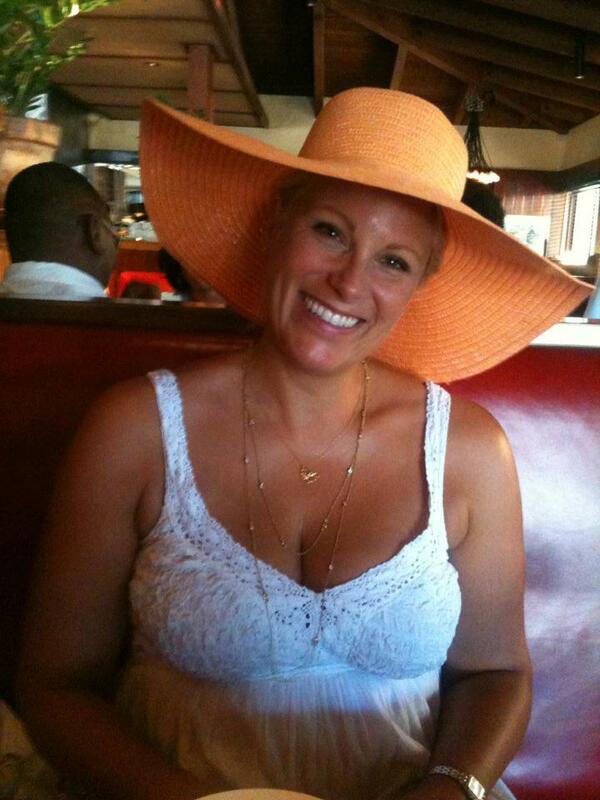 I had many opportunities on St. Maarten to become what I desired if I wanted to. I could have been a big businessman. Instead I took the road less travelled. I had not made 2l when Claude Wathey sent me here from St. Maarten to run his campaign for Senator in l962. The l42 votes which the DP, Windward Islands won by was largely due to the votes I was able to get for Thomas Van Hugh Hassell of The Bottom. By the way he was the godfather of my brother Freddie and related to us through the Vanterpool/Simmons family. General Workers Union to write the Labour Spokesman. At the same time I started the Saba Herald which I published for the next 25 years and the St Eustatius Gazette. In l969 the stage was set for me to oppose Claude Wathey and I did so well that the following year in November l970 we were able to launch the Windward Island’s Peoples Movement. We were able to get a majority on the Island Council on Saba months before the elections. Then Administrator with the Rev. Father Aldrick Hassell celebrating two hundred years of The Church of England on Saba. Year 1977. I recently published a book Dreaming Big and said a long farewell to the people of the Windward Islands in articles entitled “Letter to Myself.” I must thank once again those on Saba, St Eustatius and St Maarten who continued to support me and who have gained for me recognition far beyond the islands. I have set many records for others to try and break. The one I am most proud of is that in every election in each voting district in the Windward Islands I received votes on my name, regardless to my position on the list. And Mr Chairman I have run in many elections. When I was not running myself my hand was felt in the candidate which I supported. Those who are wondering what I will be doing, Roger Snow once wrote that the few times that I was in the opposition no one outside of Saba knew as they thought I was still running the government. Making a speech for Saba Day which on the proposal of my good self was started by the Executive Council in December 1975. Very proud to see how that celebration of our roots on this small island has been accepted by the people over the years. I started out in St Maarten as a radio announcer in l965 and I wrote a column for the Windward Island’s Opinion of my deceased friend Joseph H. Lake, Sr. I have been talking to Mikey Nicholson of having my own radio program. I am thinking of calling it: Midweek with Will Johnson. I would like to highlight the history and culture of this region , this wonderful part of the world. It is not intended as a political forum but if anyone mashes my corn they will hear from me. I want to make our people more nationalistic. I am also thinking of setting up a Foundation. I have toyed with the name of Foundation Aimed At Revolutionary Change or FARC, but I have been advised by a close advisor to dress it up moderate and to be revolutionary on the inside. Left to right. 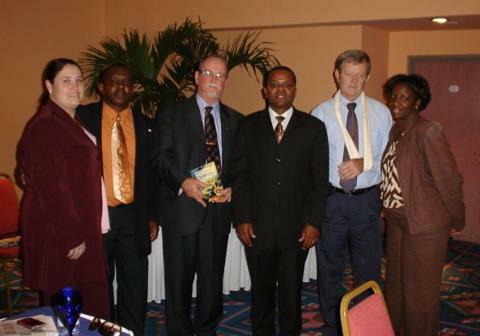 Commissioner Lisa Hassell, Island Council member Rolando Wilson, Commissioner Will Johnson, delegation leader, presenting Prime Minister Etienne Ys with one of his books, then Island Council member Steve Hassell and Island council member Lucia Woods. I am convinced that Sabans can do much more even though many young Sabans have achieved a great deal in recent years. A brief history of the historian. We will not be led by outside opinion and those who lecture down at us. I will comment on international issues without the restraint of holding political or appointed office . In discussion with former Lt. 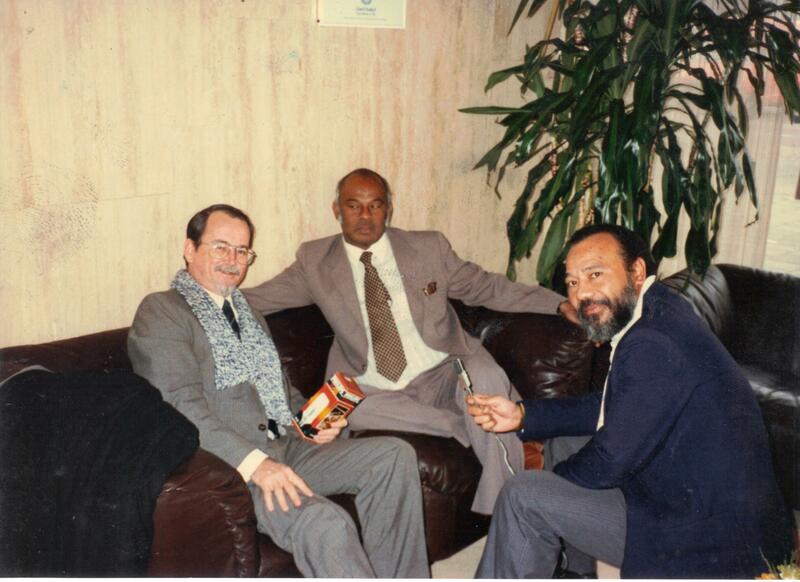 Governor Sydney Sorton and Mr. Stevanis Heyliger (father of Island council member Eviton Heyliger). With the restoration of The Hall of Knights, the centre piece of the Dutch parliament in The Hague, I was given the highest honour of any politician living or dead in the Dutch Kingdom. A speech which I made on the fiftieth anniversary of Universal Suffrage in the Netherlands Antilles was selected as one of the eighteen tapestries to be hung in The Hall of Knights. Something of which I can be rightfully proud. Thank you Saba, thank you all. Albert Kenneth van Putten was born on the ‘island of St. Eustatius on January 29th, 1937 and died on September 4th, 2014. He went to the elementary school there and then went to Curacao for his secondary education. He was always very close to his mother “Maatchie”, his sisters Louise and Margret and his brother Noel. He would always be telling me stories of his father who had become blind in his old age but who had worked for a number of years in New York. Louise van Putten, Will Johnson and Kenneth van Putten. I learned to know Kenneth on Curacao around 1955 or so when I started going to school at the Msgr. Zwijzen College. Kenneth lived with his aunt in Schaarloo where all the wealthy Jewish merchants lived. His aunt worked for one of those families and he told me many stories about life as it was in the nineteen fifties living with those families in Schaarloo. In later years I came to know many of those old Jewish families who no longer lived there but had moved elsewhere. I met him again when I was working on St. Maarten in the Receivers Office and he worked for the Cable office. He later moved to his native island and was Commissioner in the nineteen sixties for a period of time. After this he went to Jamaica to the Mona Campus of the University of the West Indies to study theology. It was his intention to become a Methodist Minister. For some time he moved through the islands of Trinidad, Barbados, and many more. We often spoke about those years. We agreed that Kenneth was definitely not cut out to be a Minister although he was an organist in the church for a number of years. He said that he realized the value of his Dutch passport when he lived in Jamaica. Since there were so few Dutch citizens living there he was on the Ambassadors invitation list for receptions. The embassy car would come to Mona Campus to fetch him and take him up to Beverly Hills to the lovely home of the ambassador with the city of Kingston spread out below. Years later I had the privilege to attend a reception at that location as well and could understand why Kenneth enjoyed so much having his Dutch passport and being invited there. 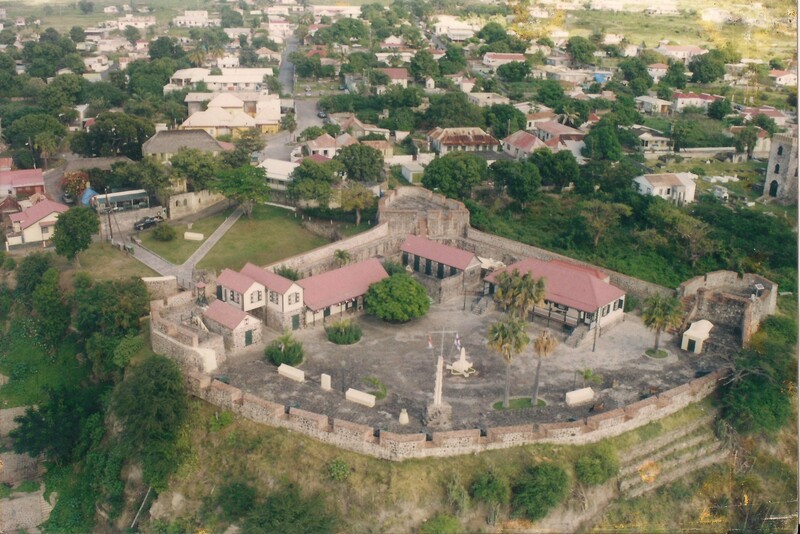 Fort Orange where Albert Kenneth van Putten served as Commissioner in the nineteen sixties. Kenneth loved a good joke and would often tell me about his adventures when trying to spread the word among the islands when he was hoping to become the future Methodist Minister on his native island. I remember one which he told me about a lady coming to him for advice. She came to complain her husband and told him that when she first got married and her foot happened to touch her husband’s under the table he would say: “Darling is that your footsie footsie?” But after twenty years of marriage when she happened to touch his leg with her foot he would shout at her; “Woman get your so and so foot off my leg;” and so on. We also traded many stories about people we used to know on St. Maarten. People like Frederick Froston, Ruth Ann from Middle Region, Mother-in-Trouble and a host of other interesting people whom we had known there. 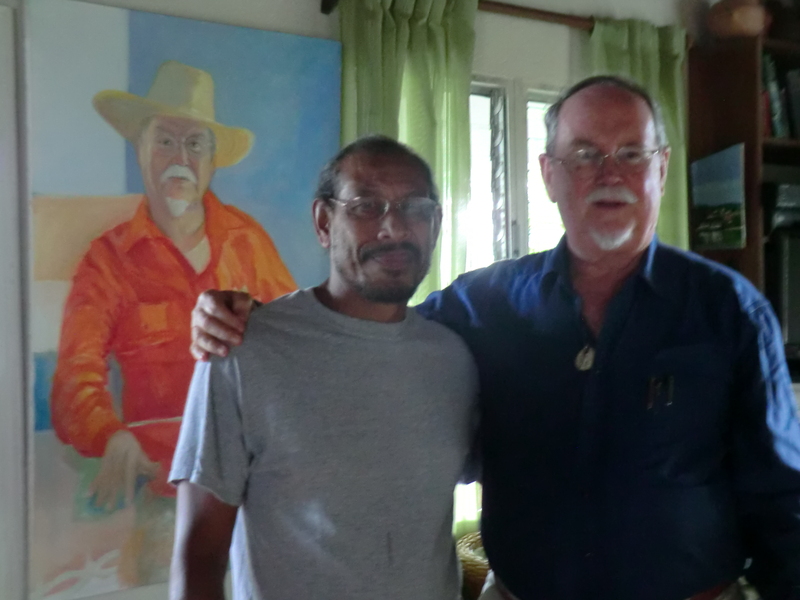 Kenneth knew so many people that it sometimes seemed to me that he knew every single person in the Eastern Caribbean and beyond. Friends of his going all the way down to Trinidad became my friends as well. He was a good imitator of the various West Indian accents. He told me once that a friend of his named Blackwater was up at the grocery story of a mutual friend of ours Daphne and shouting out about some problem he was having with a young man from St. Kitts. Kenneth called Daphne and in a heavy Kittitian accent told her that he wanted to talk to Blackwater. Kenneth then proceeded to tell Blackwater that he was coming down on the next flight and the next thing he planned to do after he stepped off the plane was to bust Blackwaters mouth and send him to the dentist for a set of false teeth. Before Blackwater could answer Kenneth hung up the telephone and listened to Blackwater bawling out from the distance and coming down in his direction as to what he planned to do with that Kittitian. Anyway Kenneth listened to his story (as if he did not already know) and advised Blackwater that the boy sounded serious and that he better go and lodge a complaint with the police. Advice which was taken and as Blackwater went in the direction of the police station Kenneth could hear him shouting out and telling everyone he passed about that fresh Kittitian boy who had called to threaten him. 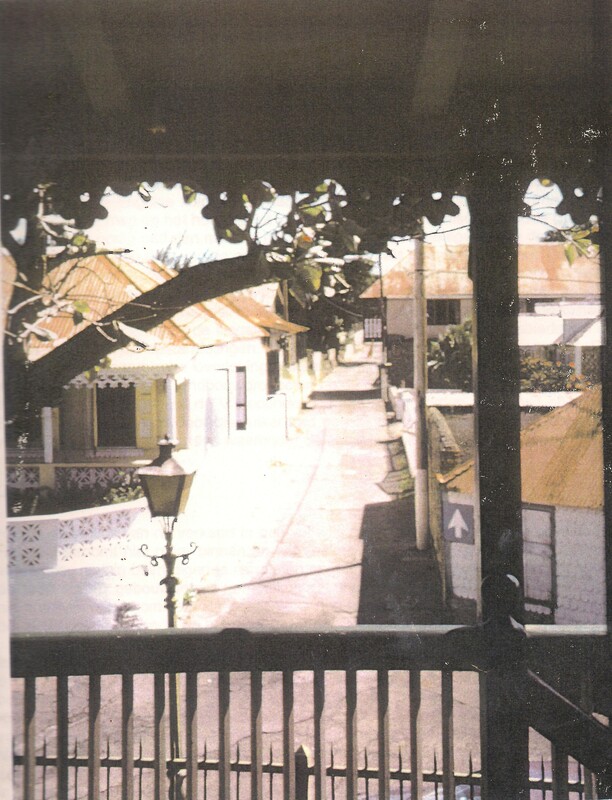 The street on which Senator Kenneth van Putten lived in the two storey house on the right and where he also died and next door he will be buried in the cemetery of the Dutch Reformed Church. His home was open to all. Senator Millicent de Weever told me that she once was trying to get him on the phone. She let it ring for a while. Then someone came on the phone out of breath. She asked him where was Kenneth. He said:”I don’t know but I was passing in the street and heard the phone ringing and came in to answer it.” Another time my wife Lynne our two boys at the time Teddy and Chris and I were invited to his home for a bar-b-que. A friend of his Carlyle Maillard was manning the bar-b-que pit and other friends were helping out. When we sat down a friend of his Movida came into the house as if she was in a hurry took a couple of chicken legs off the table and went out the door shouting to him:” You think that you going to feed your white people and leave we poor black people here to starve?” Knowing that it was a joke we had a good laugh. However the children were small and they remembered it differently. They thought it was for real until I told them that she was a good friend of Kenneth’s and mine and was just pulling a joke on him. 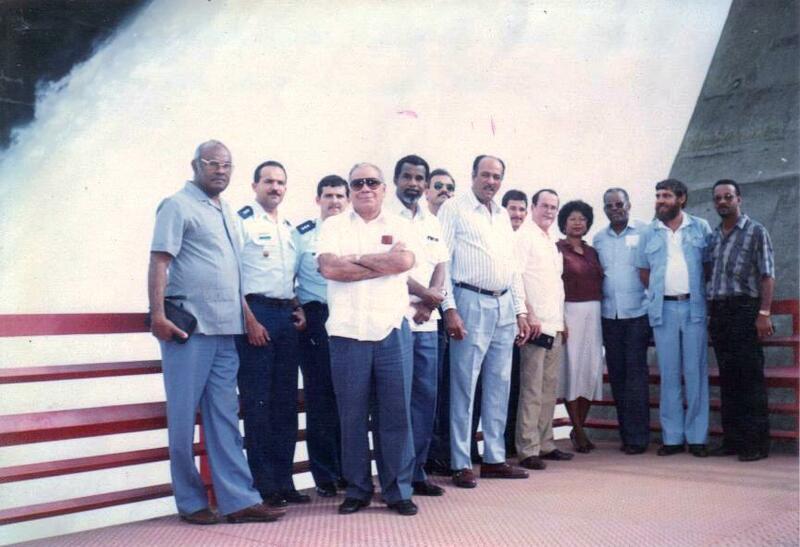 Senator van Putten as part of a delegation of the Netherlands Antilles Parliament at the Guri Dam in the south of Venezuela. 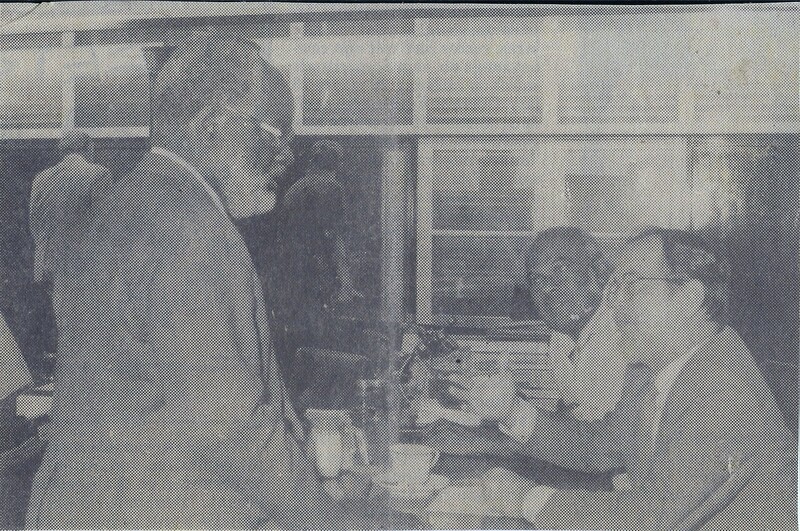 Senators Kenneth van Putten and Will Johnson in The Netherlands being interviewed by well-known reporter Eddy Williams of Sierra Leone. 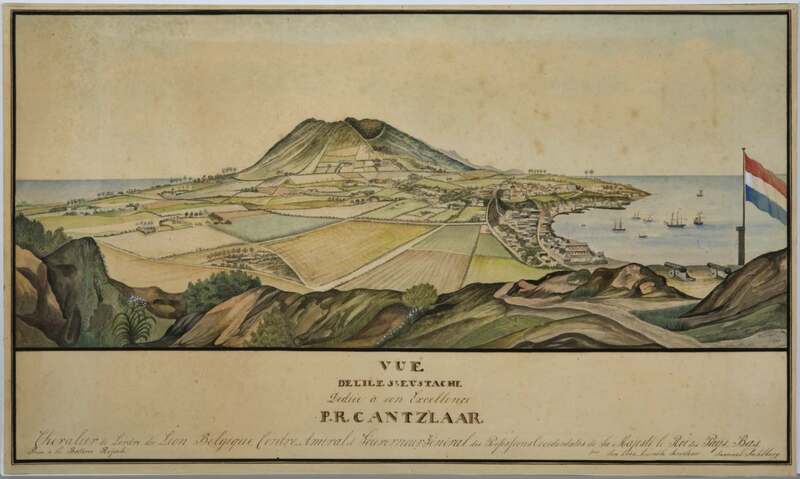 An old painting of Sint Eustatius when it was known as “The Golden Rock” and the island which was the first to recognize the flag of the newly independent United States of America. 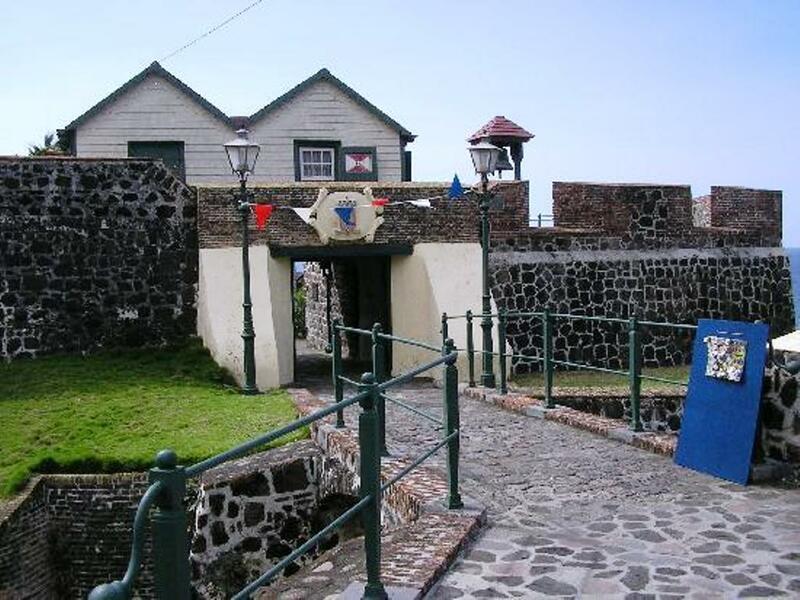 Senator Kenneth van Putten’s two homes are situated behind Fort Orange from which The First Salute to the flag of the new nation the USA was fired thereby recognizing that country as an independent nation. 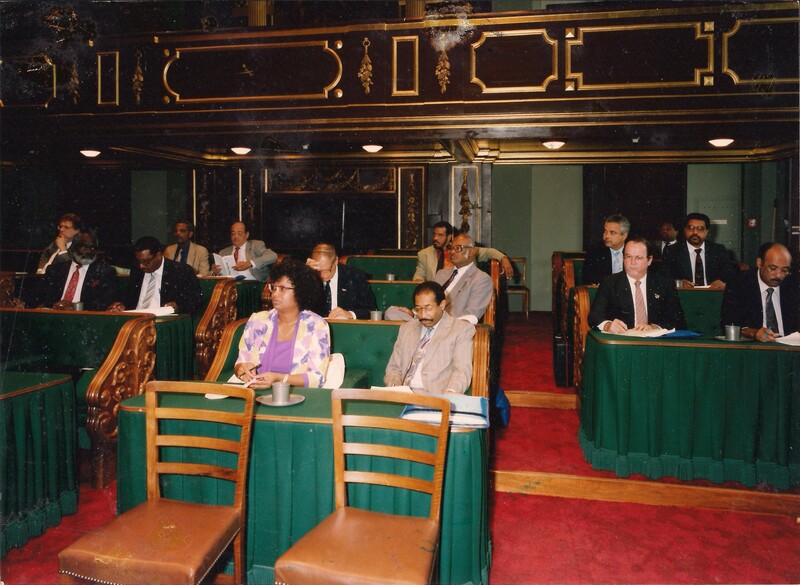 Senator Kenneth van Putten with other members of the parliament of the Netherlands Antilles in a meeting with the First Chamber of parliament in The Netherlands. The other memory I would like to recall is his aunt’s coffin. The old timers would have their wooden coffin built and stored under the bed ahead of time. And so his aunt from whom he inherited his house had her coffin built. Many are the times when someone would come to the door in the middle of the night and shout out “Mister Wan Putten, I want to borrow your aunt’s coffin.” Someone had died and a coffin was needed in a hurry and so after the person was buried they would have another coffin built for his aunt and return it to be stored under her bed. Before the good lady died her coffin had been buried several times before her. He told me many stories about his father. When his father thought that Kenneth was drinking a little too much he told him:” Kenneth I am not going to tell you to stop as that will not work. All I am asking you to do is to slow down.” Kenneth’s father worked for a Jewish tailor on Fifth Avenue in New York and would make deliveries to some of the wealthy families on that famous avenue and could tell stories about how they lived. One of his observations was that the Germans did not give their children toys to play with but blocks to build with and that is why the Germans were so smart. 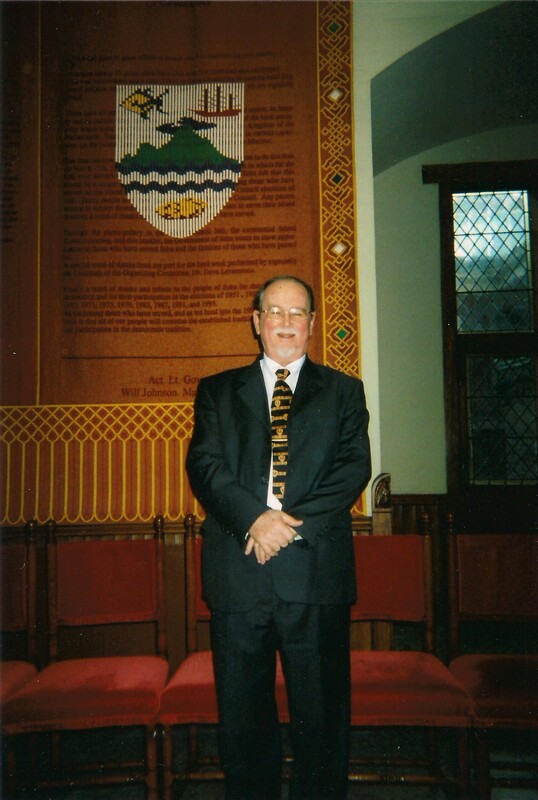 After he became a Member of the Windward Islands Council we met quite often as I was in the council as well. He was in the opposition and my party the WIPM was in government on Statia as well as Saba. We really became friends because of the following incident. There was a meeting on Curacao to which the islands had been invited. Each delegation had a rental car assigned to them. I saw Kenneth on the sidewalk by the airport looking for a taxi. I stopped and asked him if he needed a lift to town as we were all staying in the same hotel. He took the lift with us. The next day in the meeting he thanked us and told us that his own delegation had refused to take him in the car assigned to them and thanks to Saba he had made it to the meeting. 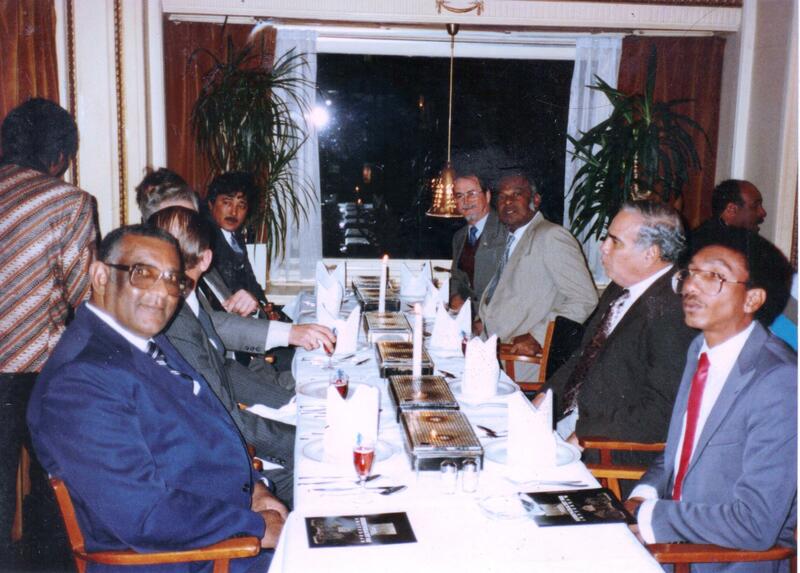 Senators Kenneth van Putten and others at a dinner on one of the many visits of Parliament to the Netherlands. 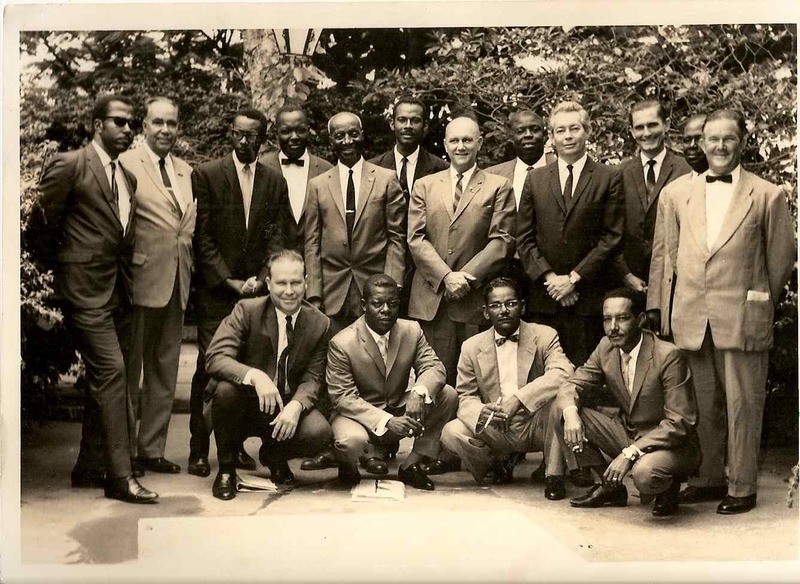 The Island Council of the Windward Islands with then Island Council member Kenneth van Putten standing behind Milton Peters and Lt. Governor Jan Jacob Beaujon. 1967. 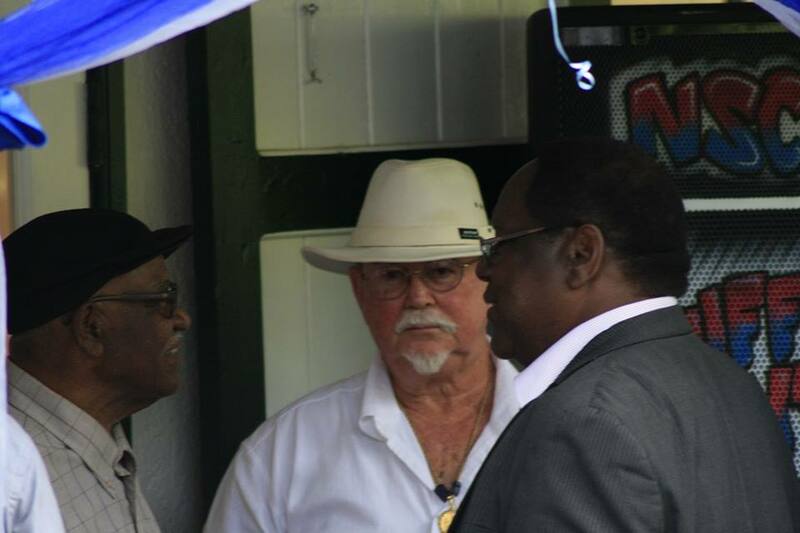 Prime Minister Don Martina talking to Senators Albert Kenneth van Putten and Will Johnson in a moment of crisis and within the hour the government had tendered its resignation. He and I became Senators in January of 1986 and were in coalition first with Prime Minister Don Martina and then later with Prime Minister Maria Liberia-Peters. We went through some turbulent times together. Senator Millicent de Weever from St. Maarten used to travel with us for eight years. We always rented one car and lived together like family. Millicent would always say that if the three islands could live together like us then there would be no problems between our people. And the jokes we all had together. 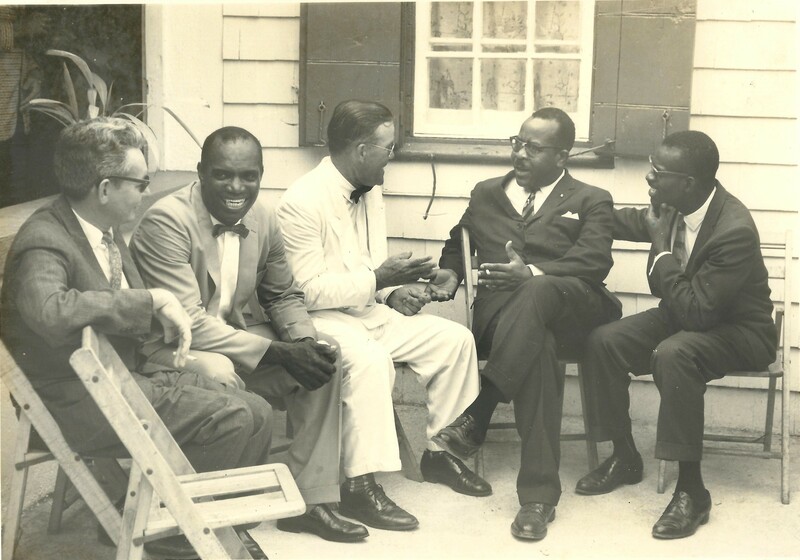 Kenneth always had a host of his Statia people and especially his colleagues from the Democrat Party in tow with him. We used to like to go to the Golden Star restaurant which specialized in Creole dishes. Also Kenneth and I frequently visited Minister Stanley “Brother” Rogers and his daughters and there again it was nothing but good jokes. In a eulogy for an old friend on Statia he told the story about her trip to Curacao with him and me. He took us upstairs in the airport restaurant and treated her with lobster and so on. Nothing but the best for his friend. On Curacao we first passed by a friend to drop off some boxes. The moment he left the old lady turned to me and said: “Lord Mr Johnson, we need a change on Statia. He ain’t doing a thing for we.” When he returned and we dropped her off in the Oranjestraat, nothing but hugs and kisses and thank you’s. After he drove along for a while he asked me: “What did she have to say when I left the car?” When I told him he laughed his head off. He said: “I thought so. She is not for me but she is a good friend of my mother so I have to treat her well.” And treat everyone well he did. He was known throughout the island for his generosity. Kenneth van Putten as a young man checking out his future grave site in the cemetery of the Dutch Reformed church. I have besides the good memories many souvenirs in my house to remember him by. The chair I am sitting in while typing these memories of our friendship was given to me by him. It is one of the baptismal chairs from the former Jewish Synagogue on Statia. He had it from the house which he inherited from his aunt who in turn had inherited it from Mr Arthur Valk (Hodge) a teacher and intellectual who never married or had any children but who in his last years was taken care of by Kenneth’s aunt. Also several other pieces of furniture which are several hundred years old and which I had restored here on Saba. Even some love letters from Minister Rufus Plantz in his excellent handwriting trying to lure back one of Kenneth’s aunts who had flown to New York to get away from his amorous advances. There are also so many memories of our travels together and those which I missed out on. July was a month I did not like to travel as I wanted to spend as much time as I could with my children. One February though when I had a tough election campaign we were invited to a meeting in Spain and were scheduled to meet and greet the King. I decided not to go as it was the week before the election and I wanted to be close to every voter. Kenneth went and met the King and really enjoyed seeing Seville. He came back and won the election whereas I lost that one. Another time there was a meeting in Brazil and all of the heads of state would be there including Fidel. In the end I chose for staying with my children. Kenneth went and shook hands with Fidel. Years later I had the same privilege on Cuba. We travelled to nearly all the Latin American countries together to attend meetings. Later on as a Member of the ODCA I was able to visit those which I had not visited before, and then in 2010 I was elected back to the last Parliament of the Netherlands Antilles and was able to cover a few more countries. We shared many memories of famous Antillean politicians which we worked with in parliament and as coalition members in various governments. Kenneth never forgot a name and many times I would have to call on him for a name of one of our former teachers or something or the other that I needed to know about any of the many politicians we had relations with in the past. 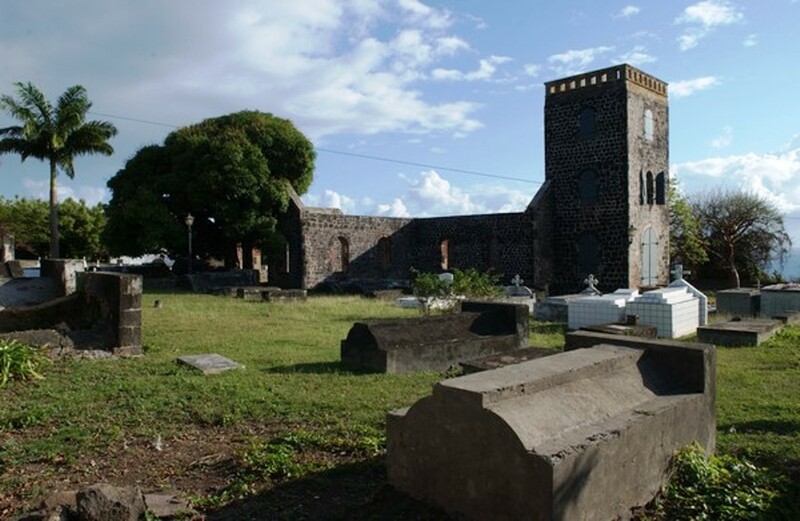 The Dutch Reformed Church ruins and cemetery where Senator Albert Kenneth van Putten will have his final resting place next to his home. Since his retirement I would call him or he would call me at least once a month. I am also close to his sister Louise and had served with her in the Post office on St. Eustatius in 1961 for some weeks and she was my boss. We have remained friends throughout. When I told him that my wife Lynne and I were expecting another baby at the same time I told him that if it was a boy I would throw his name in between the others. And so I named him Peter Charles Albert. Several times Peter asked me to explain him about the name. When people would call him Peter Charles he would always tell them; “Don’t forget the Albert.” Saddened as I am with the loss of a good and generous friend I am consoled by the fact that in my son Peter who is now an engineer I will always remember my dear friend and Brother Senator Albert Kenneth van Putten. May he rest softly in the Dutch reformed cemetery next to his home on the Kerkstraat! Farewell Kenneth! His beloved island of which he wrote such beautiful poetry. On January 10th, 2008, Mexican writer, poet and politician Andres Henestrosa Morales, a Zapotec Indian, died at his home in Mexico City. He died of pneumonia at the age of 101. He had been a life long defender and promoter of his native language and culture. Henestrosa was born in southern Oxaca state and did not learn Spanish until 1922, at age 16. His work often focused on indigenous cultures and languages. In 1922 he wrote “Los hombres que disperse la danza ( A Nation scattered by the Dance), his single most influential work, and in 1936 he published a Zapotec – Spanish dictionary. He expressed for me in an eloquent way why I like to write. To get readers involved through my writing in the lives of our people who have done us proud. Book published by House of Nehesi on St. Maarten. Beatrice Pfaffhauser a child of “The Gap’ on Saba. Charles Borromeo Hodge Jr. died tragically. It was not an accident. He interrupted his own life. I am sure he gave it some thought. It could not have been an act of desperation. He had friends he could have called on. I can only liken his death to the painter Vincent van Gogh cutting off his own ear. Artists are different from the rest of us. That is why I started off with his admiration of another persons work. Talented as he was with the use of words, he crafted his poems like a good wordsmith and recognized talent in others. Rural St. Martin of former times which spoke so much to his imagination. He wanted to leave the world behind with a statement. The big question for his friends is what was the statement which he was trying to make. Was it disappointment with life, or with the lost beauty of his native land which he so much cherished from his youth? When praising someone others take offense. Everyone cannot be number one. But when it comes to poetry Charles Borromeo Hodge Jr. does not have his second in my opinion in the Eastern Caribbean. England produced Shakespeare, St. Martín produced Charles Borromeo Hodge Jr. It is as simple as that. Not that I am comparing his work to that of the great bard. Not at all. I am comparing him to all the lesser poets in the Eastern Caribbean. What I see going around in the name of poetry does not speak to me. Charles Borromeo Hodge Jr. sets out to exhaust you; to make you feel guilty for the wrongs against nature and the foibles of humanity. And, those who are aware of how things were years ago, have to agree with him. On the beach in Philipsburg next to the old wharf. He was a small man and he was tidily dressed. He wore a hat, a white shirt and black trousers. We had four small gru-gru palm trees and they were full of uninvited bees. His English was so good, it didn’t sound natural, and I could see my mother was worried. He spoke very slowly and very correctly as though every word was costing him money. We watched the bees, this man and I, for about an hour, squatting near the palm trees. And he put the paper back in his pocket. He didn’t seem to mind. ‘You’re as good as me,’ he said. I thought Borromeo should meet Roland Richardson. I told Borromeo where to find him in Marigot. A few weeks later Roland told me that he had met him. Since Roland was doing an article on Marigot for the Discover Magazine, and perhaps more to get rid of him than anything else, Roland asked Borromeo to do a poem about Marigot. Within 24 hours Borromeo was back with what is perhaps the only, and certainly the best poem, ever written about Marigot. Roland needed no convincing after that. He recognized Borromeo’s great talent. White Wordsworth had met his soul brother Black Wordsworth. Marigot main street in former times which has retained much of its look today but with much more traffic than pictured here. While doing this article I came across another article which I had written for the Weekender exactly ten years ago. The more things change the more they remain the same. In that same newspaper of Saturday November 21, 1998, Saba was saying farewell to Lt. Governor Sydney Sorton and many of the same news items of then are still with us today. Mark Twain more than one hundred years ago designed a newspaper with headlines that he predicted would still be around in the year two thousand. The headlines were. 1. A coup in Latin America. 2. Rising crime in the cities. 3. Stock markets about to crash etc. So another article about Borromeo is now due to remind people of his great talent. Philipsburg back in the nineteen fifties when Borromeo came to live there from Aruba. 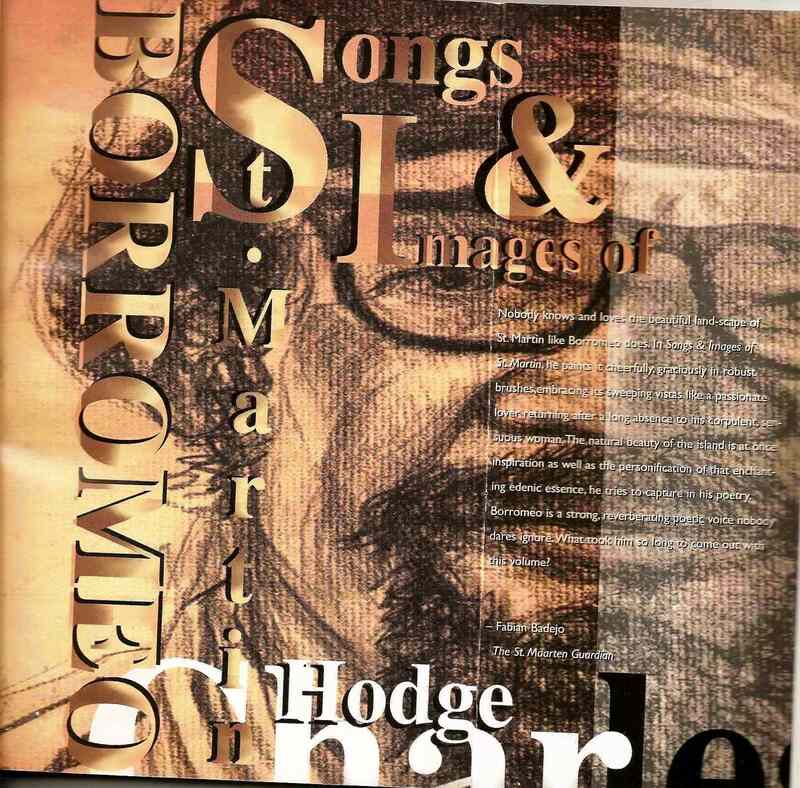 Charles Borromeo Hodge Jr. was born on Aruba on November 9th, 1939 and died November 14th, 1998. His early years were spent on Aruba, Curacao and St. Maarten. Shortly after he finished school on Curacao and had returned to St. Maarten he started working for the then newly established St. Maarten Harbour Corporation. He was also involved with the Voice of St. Maarten when it was founded by Mr. de Pree in the early sixties. 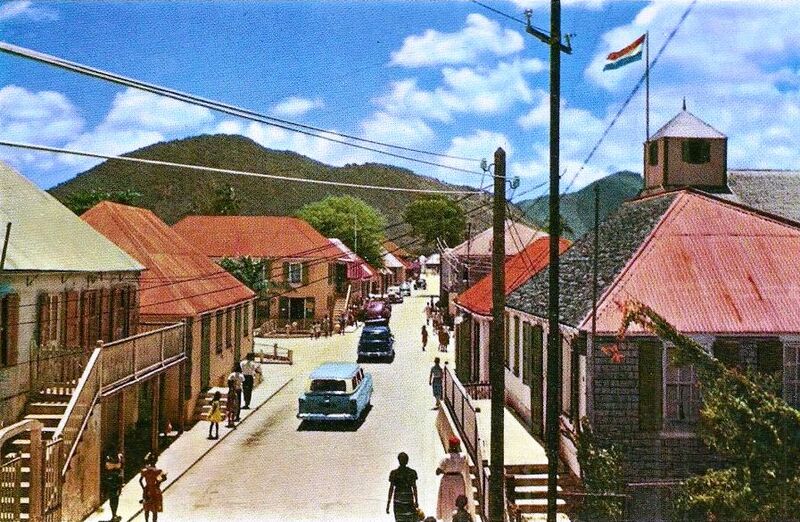 Another view of Philipsburg as it looked in the nineteen fifties. His years of exile in New York City brought out some of his best poetry which was published by House of Nehesi Publishers in 1997 in a volume entitled Songs and Images of St. Martin. I corresponded with him off an on over thirty years. Regrettably when I was a bachelor moving from pillar to post I lost some of my most interesting correspondence. However I still have a file interesting enough for someone who would want to write a book about his life. I could tell that his heart was troubled from one of the last poems which he wrote. Its powers sealed within the past. Nor touched my heart with calm and peace. That followed me throughout the day. That’s when I faced the cruellest test. As though it were my faithful bride. Will ease or lessen my despair. The victim of a life-long curse! One of his poems which I like best was one he wrote when he went into exile to New York which is entitled; ‘ Farewell To St. Maarten’ from which I will quote to end this article and as a tribute to him. Of boundless oceans soon must rise. Your fest of beauty I must leave. 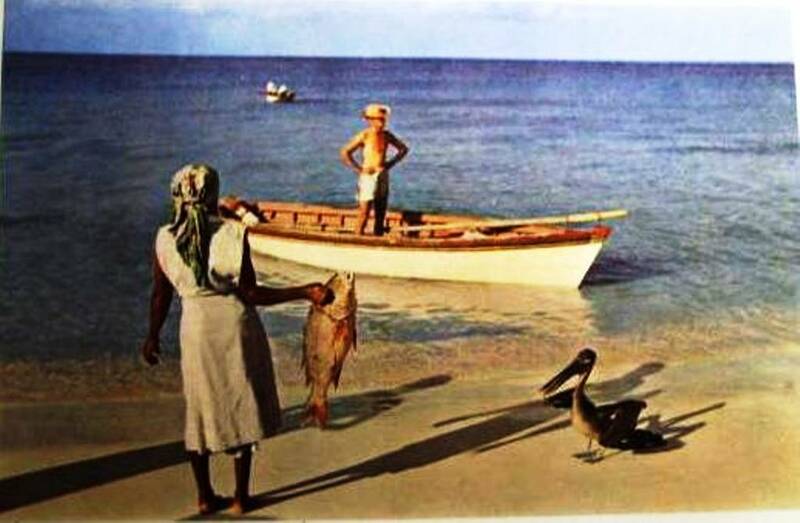 When you heard the Simpson bay fishermen blowing the conch shell like a horn you could go to the beach and buy your fish. I don’t think Borromeo turned his heart from St. Maarten. It was the other way around. The island of his youth which he returned to he could not recognize or cope with. I invited him to lunch at a prestigious restaurant. He was ill at ease. He told me that he would have preferred to have gone back in time to when he and I had argued politics at the Zanzibar on the Backstreet. That we could all go back in time. 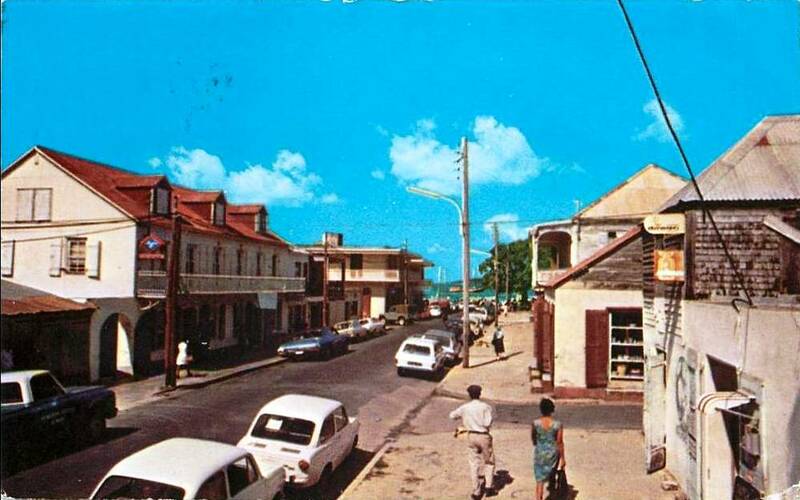 When the streets were empty and quiet in the old St. Martin. This is Philipsburg. However we must be realistic and adjust to the changing times on our islands in the sun. Prime Minister Efraim Jonckheer and Commissioner Mathew Levenston in discussion. During hurricane season I often think of him. He once said to me: “Will why you are building your house up on the top of that hill? Did you ever see any of the old timers building up so high?” And then he went on to tell me stories of the hurricanes of old passed down by our ancestors. After hurricane Lenny the officials from the U.S. Weather Bureau in Miami visited Saba and confirmed the same thing to me. Where my house is located, around two thousand feet, a category one hurricane is paying me a category three visit according to the officials. 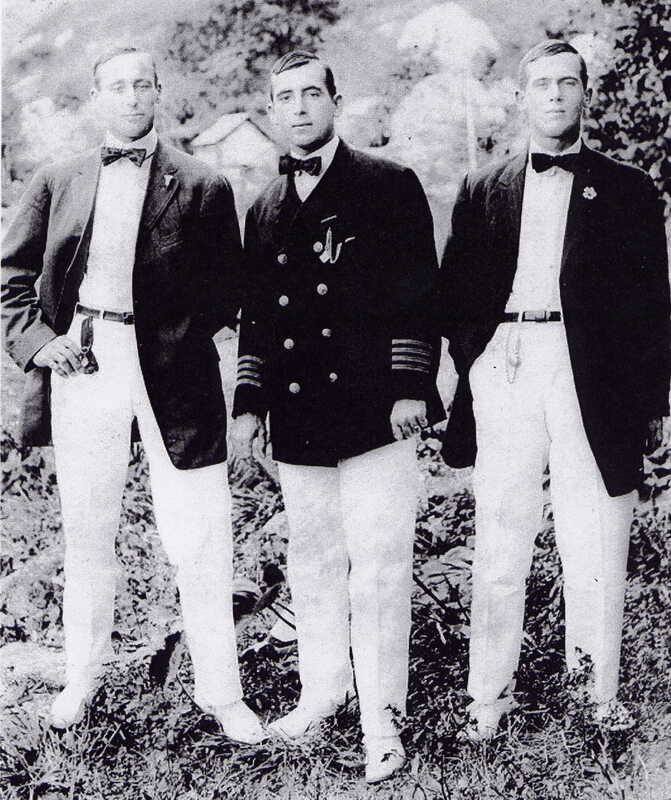 Captain John Esmond Mathew Levenston was born “Below-the-Gap” on Saba on October 3rd, 1912. He was the son of Joshua Levenston and Mrs. Emilia Levenston born Hassell.He passed away on St. Maarten on June 30, and was laid to rest here on Saba on July 4th, 1994. The world which he grew up in was much different to the Saba the young people know today. He, and my father and most other Sabans of the older generation were not privileged to attend school of any kind. In those days life was hard, and all family members had to do their part in order to survive. Yet as Matthews’s life proved, his lack of a formal education did not serve as an impediment. A good dose of common sense and a willingness to work led him forward and to achieve much for Saba and its people. He started sailing when he was eighteen with Captain Randolph Dunkin on a small sloop called the “Nautilus”. His very first trip from St. Maarten on the “Nautilus” nearly ended up in disaster as a squall caught the sloop just outside Fort Amsterdam and nearly turned her over. He continued sailing on that sloop for over a year. As was the custom back then, he, like many others headed for Curacao where he went to work for the Shell Oil Company. He started sailing on Shell oil tankers, one of which was named the “Alicia.” He mostly sailed between Curacao and Lake Maracaibo hauling crude oil for the refinery. After a couple of years he went to Aruba and worked there on Esso oil tankers, again hauling crude oil from Venezuela and carrying oil products between Aruba and Jacksonville Florida as well as to other ports along the Gulf of Mexico. 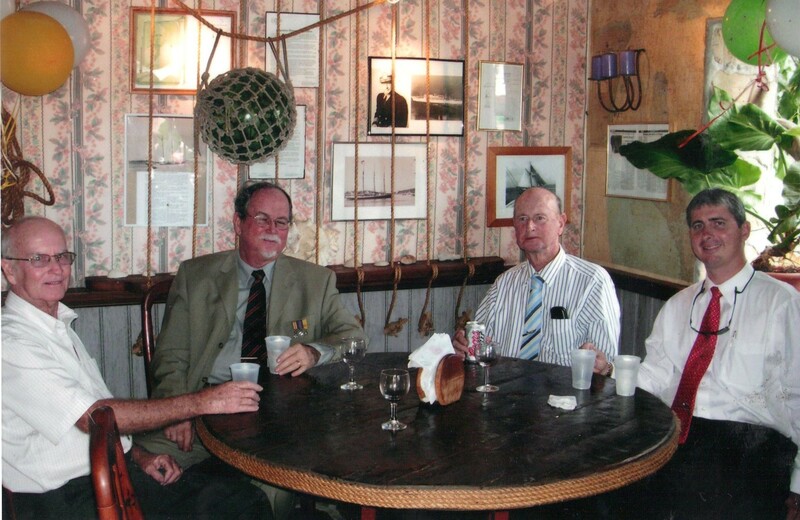 Claude Wathey, Mathew Levenston, Arthur Anslyn, Ernesto Petrona and Diderick Matthew, all political allies of the D.P. and the P.P.A. political parties. Sailing on an oil tanker during World War II was a very dangerous business as they were the targets of the German submarines known as U-boats which wanted to deprive the Allied Forces of much needed fuel of which two thirds were provided by the large oil refineries on Aruba and Curacao. During World War II the tanker on which Mathew sailed came into the harbour in San Nicolas loaded down with crude oil for the Esso oil refinery. The tanker had to wait out in the harbour to get into berth as there were other tankers waiting as well. Little did they know that a German submarine was lurking below waiting to blow up the oil refinery. The submarine attacked during the night of February 16th, 1942, and Mathew and several Sabans had to take to the water in a sea of fire. The late Hubert Smith and Willa Every were also part of the crew of the tankers which went down, and they survived. Several other Sabans though lost their lives that night, while Mathew swam for eight hours. He swam from San Nicolas harbour all the way down to above the Strand Hotel in Oranjestad before he was picked up. The four tankers which were torpedoed were the “Pedernalas”, the “Oranjestad”, the “Tia Juana” and the “San Nicolas.” The “Pedernalas” was beached and later restored. The tankers had a crew of 102 of which 47 lost their lives. Those from Saba were: Clifford Achilles, Wilson Fireman age 30, Kenneth Darcey Lynch, sailor 33, Eric Norbert Linzey, mess boy 21, Anthony D. Jackson, student fireman age 37 and James Stewart Cornett,sailor age 28. They all sailed on the “Pedernalas”. On the “Tia Juana” John William Dunlock, Quartermaster born Saba Feb. 3, 1905 and Walter Whitfield born Saba August 12, 1912, Fireman also lost their lives. So on that one night alone Saba lost seven men in the attack on the Lago oil refinery. 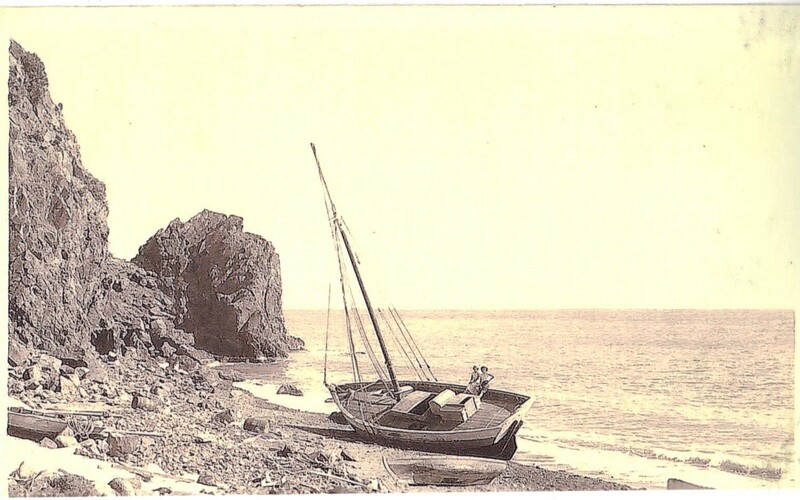 After that experience Mathew came back to Saba and he bought a small sloop called the “Astria” which he renamed the “Gloria” after his daughter. In the meantime he was married to Mrs. Hilda Levenston born Sorton, and together they had a total of eight children. Right to left, Mathew Levenston, De Jongh?, Henry Every and Miss Cornelia Jones. Captain Mathew and I survived many political storms here on land, and together we also survived one at sea. The storm at sea took place on September 1st, 1959. We left here at five in the evening for St. Maarten. The other passenger was Mr. Percy Labega the father of Mr. Clem Labega among others. Around eleven o’clock that night a sudden storm came up and there we were out in the middle of the ocean. Before we left Saba, Captain Mathew had said that he did not like to leave as his uncle Fernandus (Feredoom) Hassell was dying and would call him back. Well call him back he certainly did. We passed through a night of sheer terror. By the next afternoon we had been tossed about and drifted till we ended up to the South of Saba. An oil tanker almost ran us over. It passed so close to the sloop that you could nearly touch its sides. Luckily the next day people spotted the crippled sloop drifting in the distance and a motor launch of Kenneth Peterson’s came out and helped to tow us back into the roadstead in the late afternoon. In W.F.M. Lampe’s book “Buiten de Schaduw van de Gouverneur” he has a chapter on how he, the then Minister of Finance Juancho Irausquin, and Lampe’s daughter Sheila nearly got lost on the” Gloria” in a storm with Capt. Mathew. Lampe claims that Irausquin swore that if he survived that he would try and get some money from Holland to build an airport on Saba. 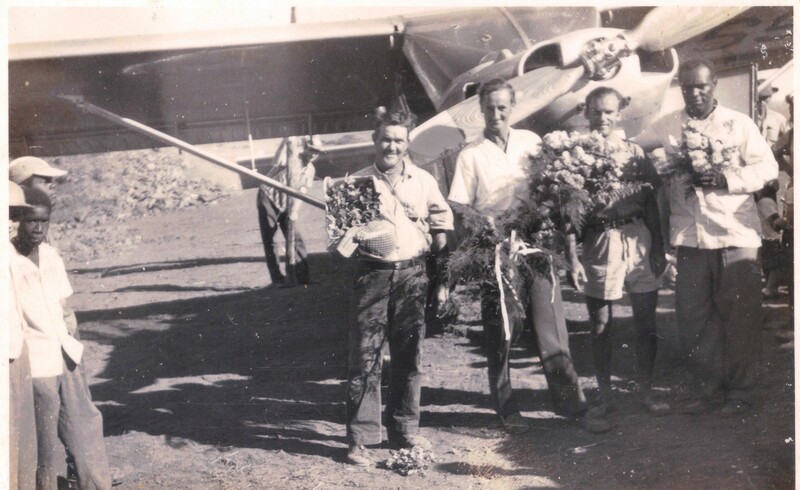 Left to right: Arthur Anslyn, Remi de Haenen, mechanic and Matthew Levenston, first plane land February 9th, 1959. Other sloops which Mathew owned were the cobalt named the “Anna Louise” which went ashore in a hurricane on St. Maarten. Then he had the “Island Pride” which ran into the Diamond Rock by Saba and sunk. Once again Mathew found himself for five hours in the water. After that he bought the large sloop the “Fidelity B.” On a trip to Statia the rudder head of the sloop broke and it started to drift. He managed to anchor on the Saba Bank where he remained for four days. On the evening of the fourth day his anchor chain broke and the sloop went adrift once more. Leo Chance was Minister then and he gave the Dutch Marines directions on how to fly from Curacao. By that time Mathew had been listening on the radio as to how the search for him had been abandoned. But the Marine plane located him and threw out flares. A fruit boat rescued him about 150 miles South of Saba and took the sloop in tow, but it was later abandoned. Mathew and his son and the other crew members were taken with the fruit boat all the way to Panama from where they were able to fly back home. It was after that incident that Capt. Mathew decided to throw in the towel as far as sea life was concerned. Here I am giving Commissioner/Capt. 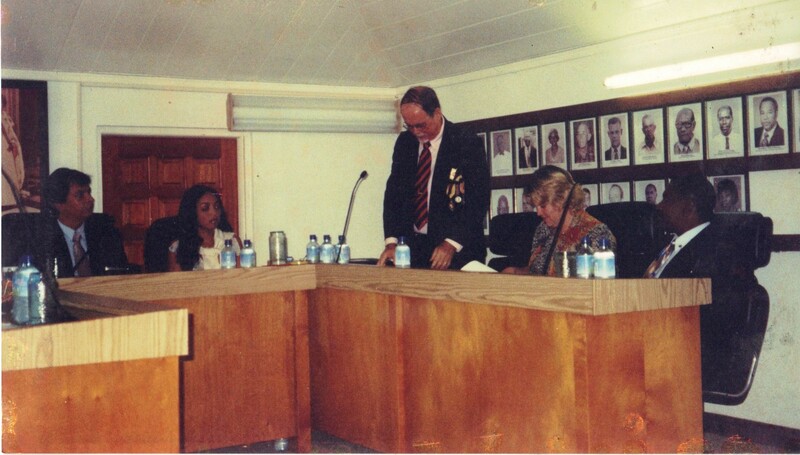 Mathew Levenston a plaque for his contributions to Saba and the Windward Islands. In the meantime Mathew had been a captain on land as well, and had quite a successful political career behind him. 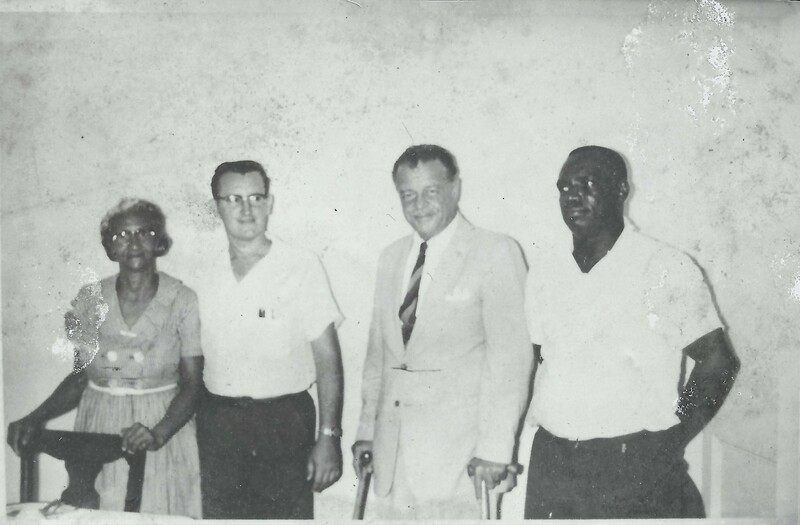 He ran for political office in 1951 and together with Mr. Ulric Hassell he became one of the Islands first Commissioners and he served on the Island Council as well. In that election Mathew only had 12 votes. The large vote getters were people like Kenneth Peterson, David Doncker, and Herman Hassell and so on. However the salary of Commissioner was fls. 50.—per month back then and the others were told that they could not own a business and be a Commissioner. By 1955 Mathew had proven himself and in turn became the biggest vote getter.He and Arthur Anslyn became Commissioners. I remember overhearing my mother telling my father that he could vote for Anslyn if he wanted to but she was voting for Matthew as he could do something for her children. My old lady had know her politics you hear!!! He remained on as Commissioner for twelve years until 1963. 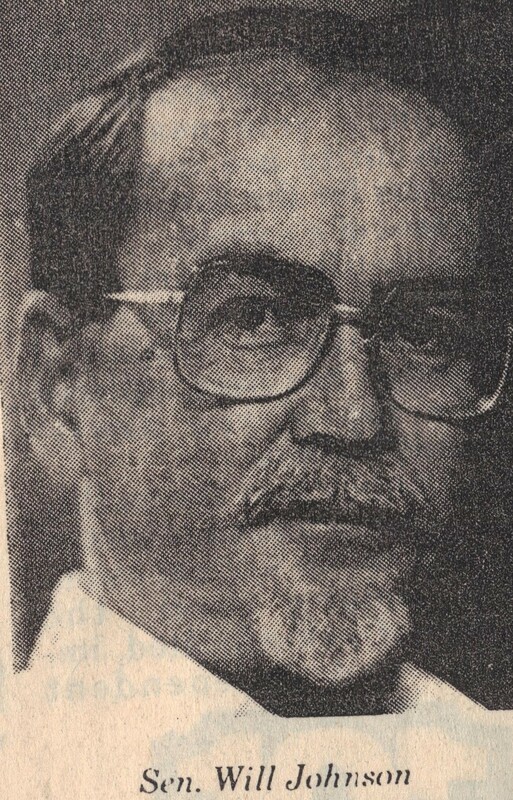 He served a total of 20 years as a Member of the Island Council from 1951 to 1967 and from 1971 to 1975. Landing of first engine for Saba Electric Company N.V. Matthew Levenston helping out. Pictured here peeping around the corner. He was not afraid of hard manual labour. During his term as Commissioner the road was built from The Bottom all the way to the airport. The schools in both The Bottom and Windwardside were also built, the hospital on St. John’s and so on. The road work provided much employment as it was all done by hand. 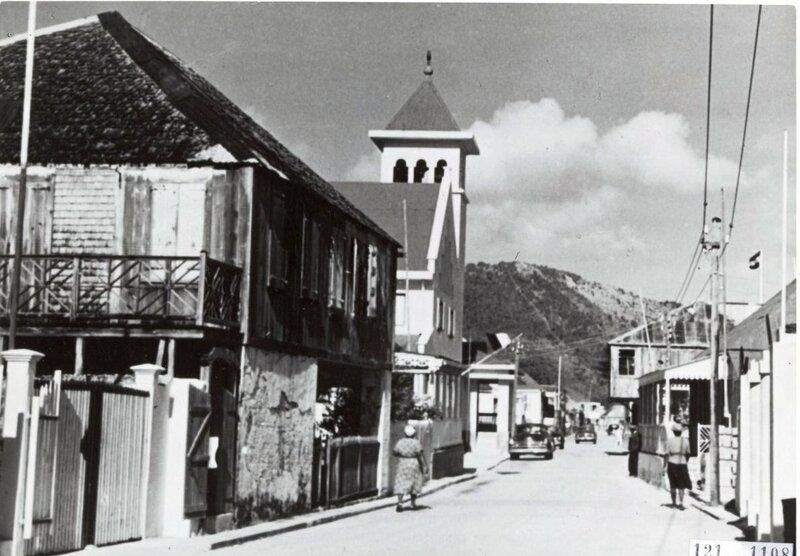 Saba before 1951 had received very little assistance from colonial headquarters on Curacao. In the old representative system a few voters elected two men to advise the Administrator of the Island on budgetary matters. Some of the local councillors stand out for very good proposals they made on how to improve the island. The local councillors were always advocating for a wharf to be built and an attempt was made in 1934 but functioned more as a lookout point than a real wharf as not enough money had been granted to complete the job. 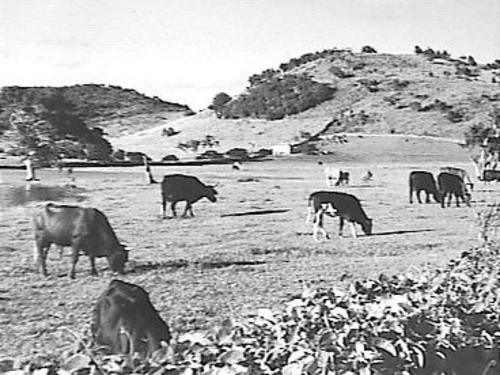 Also local councillor Errol Hassell was able to divert money on Saba’s budget in the nineteen thirties to start a “real” road in 1938 from Fort Bay to The Bottom which included the famous S-curve. However it was up to the goodwill of the Dutch colonial Governor on Curacao to approve budget proposals from Saba. His job was to keep expenses as low as possible and it was only perhaps because of an oversight that Errol’s ten thousand guilder proposal passed the Governor’s attention. From the time Saba was settled by Europeans in the early sixteen hundreds until well after World War II, the island functioned as an independent nation. All officials were local people, mostly unpaid and even when the island had nearly 2500 native residents the budget was around twelve thousand guilders a year, most of which was brought up locally from some import duties. With the exception of the historian M.D. Teenstra who visited Saba in 1829 when my great-great grandfather Richard Johnson was the Governor, the island saw few if any Dutch officials until the beginning of the 20th century. Nowadays a Dutchman comes in today and tomorrow is telling the Saba people their business and pretends to know it all better than us who have survived here for fourteen generations. Imagine! It is only when Saba started real elections with everyone allowed to vote that progress came. It came about because all the politicians on the various islands were obliged to deliver. 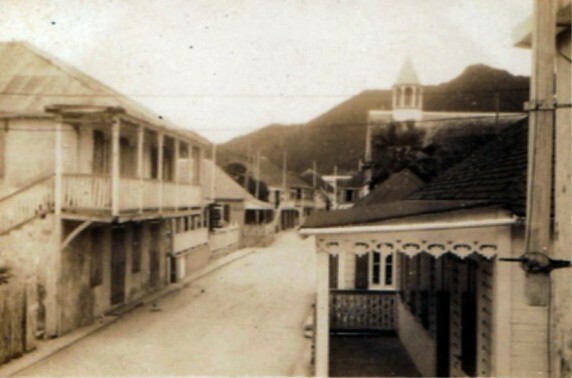 Saba as part of the Windward Islands Territory also played a role in the development of St. Maarten. 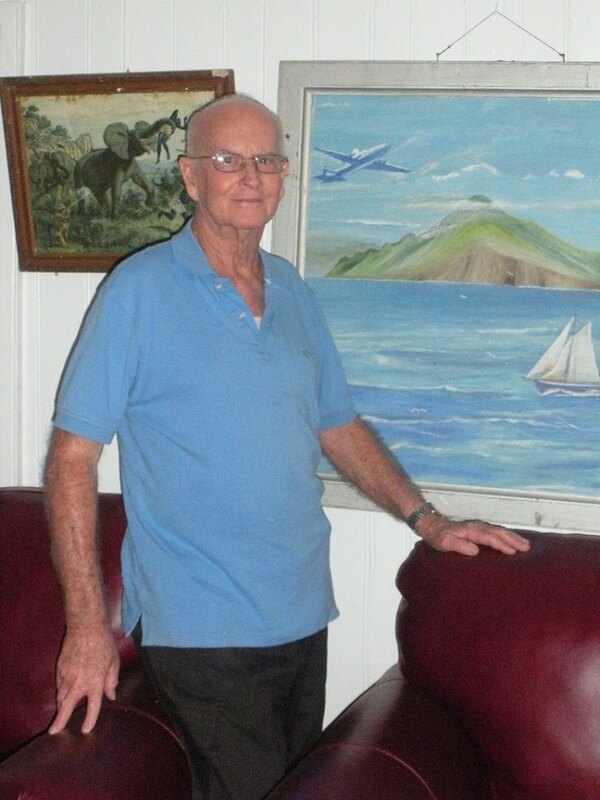 Mathew was sent on many missions for St. Maarten to Curacao in the nineteen fifties. We used to tease him how Prime Minister Efraim Jonckheer’s white dog had bitten him when one night Mathew jumped the fence to carry a message from Claude to the Prime Minister. In the process of helping St. Maarten, Mathew was accused of accepting crumbs for Saba. However compared to what we had before 1951, the funds coming in to Saba after that were a big boost for employment. 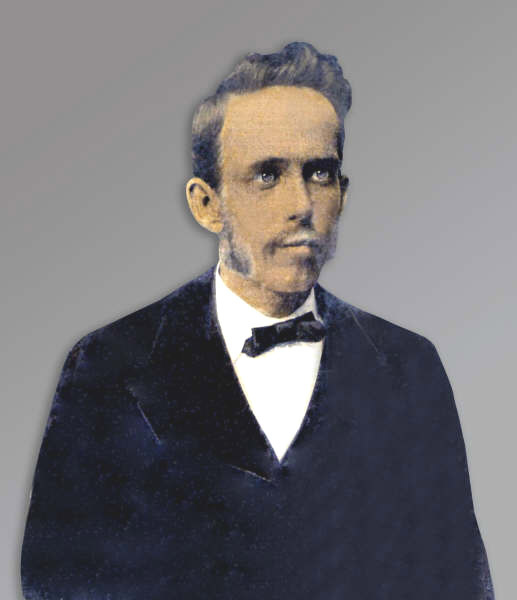 Mathew considered one of his biggest accomplishments the building of the Juancho Yrausquin airport. He said that a Dutchman had told him that an airport might be possible at Flat Point but that it would cost too much. Of course a Dutchman would say that. They still do. Mathew said he would not take no for an answer, so he asked his friend the contractor Jacques Deldevert if he had any ideas. Deldevert was a good friend of Remy de Haenen who later became Mayor of St. Barths. Remy was a daredevil, had landed on several of the surrounding islands and even had an airport on the island of Tintamarre. Remy had already scouted out Saba for a possible landing. He had already landed here in 1946 with a sea plane and had flown around the island numerous times. Remy came to Saba and they came up with a plan. He asked Mathew to get the land cleared and he would attempt a landing. The land of course had owners, much of which was owned by my father’s family where the runway is and so on. Everyone was interested to cooperate in the interest of the island. Mathew was a man who never took all the credit for himself. I have often heard him praise Eugenius Johnson saying:” If it was not for Eugenius I could not have gotten through. It was he who got permission from the owners of the land and mobilized the people to go down to Flat Point and clear the land so that pilot Remy de Haenen could land”. Despite rumours that the Administrator was against the risk of landing a plane and had even threatened to arrest Mathew if anything went wrong, the landing was a success and the airport made a huge difference in the lives of Sabans and those who since then have come here to live. Mathews sloop the “Gloria” tossed ashore at Fort Bay during hurricane Alice January 2nd, 1955. He had many setbacks with his life at sea. Of course just like the Commissioners now get unfair criticism to the point that one has to ask where the venom is coming from and why, Mathew also had many critics. He was even given a vote of no confidence in 1962 by the Island Council. A motion which he survived as the rules were different then and he was able to prove with a letter signed by the Administrator that the sloop the “Gloria” was in his father’s name and not his. Despite much criticism and some of it very unfair, he kept his calm. He would always tell me that when I was going with him on his sloop to go to school on Curacao he would admire me with so many pens in my pocket. I still carry many pens in my pocket. Even when I go to church I don’t feel dressed unless I have a number of pens in my pocket. Politically I was his opposition and in 1971 my party won the elections on Saba. Mathew and I maintained a respectful relationship all our lives. I would give him more credit in this case, as I was a firebrand and a name caller myself, and when I matured I regretted many of the things which I had said about him and other politicians and I would now admit that in his last years we actually became good friends. A speech that I made on his 80th birthday in the Anglican Christ Church in The Bottom was well received by him. So much so that when the main road in The Bottom was named in his honour by my government, he insisted to Commissioner Roy Smith that he wanted the exact same speech made for the occasion. Of course Commissioner Smith had to make his own speech, but I can assure you that Mathew was not amused. Although Roy made a good speech for the occasion Mathew told me on a number of occasions: “Man Roy mess up the thing.” And when he passed away I was asked by the family to honour him with a eulogy and I used most of the speech he liked so much also for the eulogy. He was honoured with a Medal in Gold by her Majesty the Queen, and he was also honoured by the Lions Club of Saba and St. Maarten. The greatest honour which he could not witness though was when he died on St. Maarten many of the prominent people on St. Maarten came over with the body to pay their respects and he was laid to rest next to the World War II monument in The Bottom. In my book ‘Dreaming Big” I honoured him and Eugenius Johnson for the role they had played in the early years of representative government on Saba. They opened the road for all future politicians to follow and before they passed away both of them gave me frequent advice on how to go about doing things for Saba. 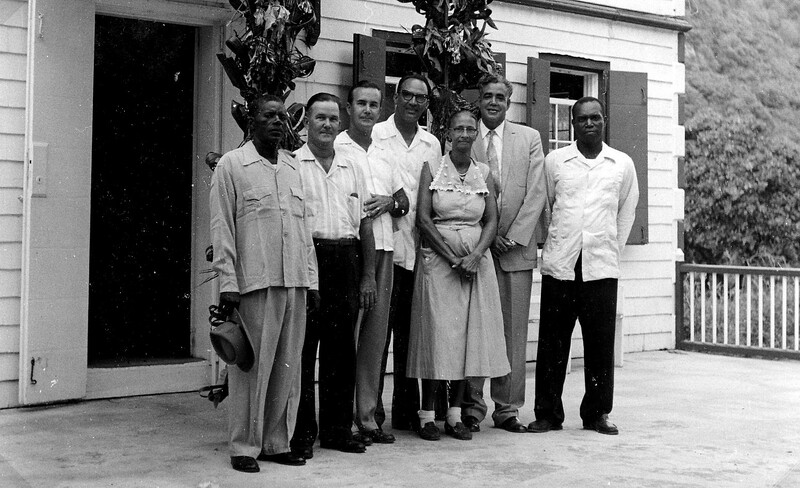 Pictured here from right to left; Matthew Levenston, Walter Buncamper, Miss Cornelia Jones, Ciro Kroon, Carl Anslyn, Arthur Anslyn and Rupert Sorton. Mathew Levenston in one way or the other touched the lives of all of us living on Saba today. His generation never had the opportunities which the young people have today. Mathews’s generation had to work in order to survive and they did so with pride and dignity. Despite his limitations in the educational field Captain and Commissioner Mathew Levenston succeeded in doing great things for Saba, and also for St. Maarten where he resided as well and shared his time between the two islands. When you drive pass the monument give him a thought. Things he may have done in the past are still of great benefit to you today. And May he rest in peace! 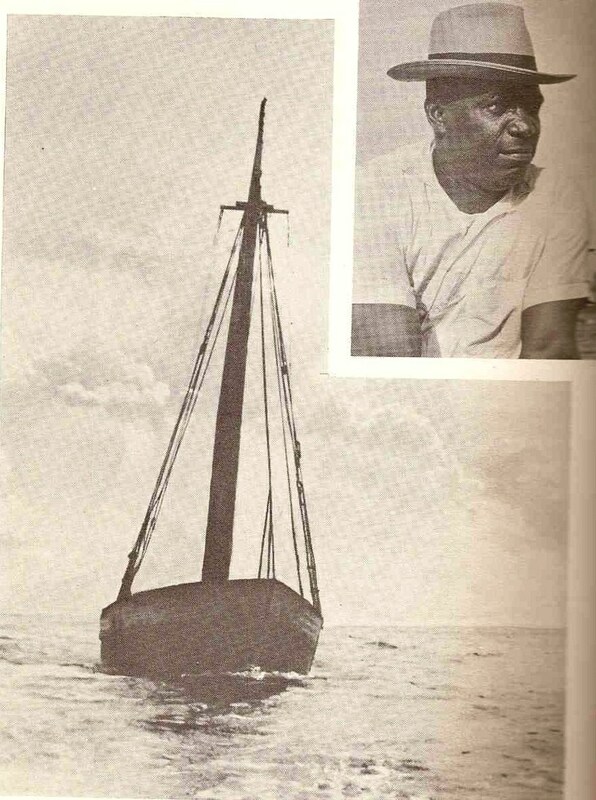 Capt./Commissioner Mathew Levenston pictured here with his sloop the “Gloria” in the book “In De Schaduw van de Gouverneur” by W.F.M. Lampe who together with his daughter Sheila and Minister Juancho Irausquin nearly got lost on the “Gloria”.